I have a working relationship with CiM Celadon, the kind where I’m always working with it. It has a really strong place in my preferred colour scheme. Its a gorgeous opaque sea green that sits very nicely in the Effetre blue green colour palette. To me, it is a shade lighter than Effetre Light Turquoise in the rod, although they look different when melted. It’s not a soft or particularly stiff glass, it does hold heat well, so it makes it a good base for long beads and sculptural work. More than likely everyone has a bit of CiM Celadon in their stash, it has been around since the first release in 2006 and is still available. 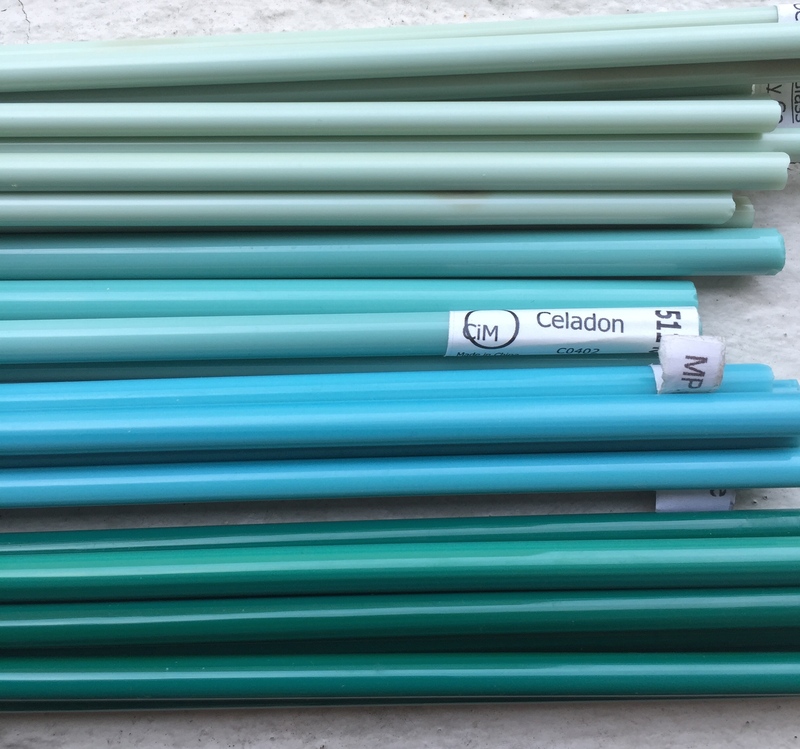 All of the Messy glass colours have cool associations with their names and Celadon is no different. The name “Celadon” is traditionally associated with a type of soft sea green glaze that originated from China and has become highly prized pottery from the dynasties it was produced in. Which, I think is a very nice nod to the heritage of the colour and the country Messy Glass is manufactured in. Barrel beads are a base of Celadon and decorated with CiM Glacier, Effetre Dark Violet, Reichenbach Raspberry and Effetre Super Clear for the dot decoration. 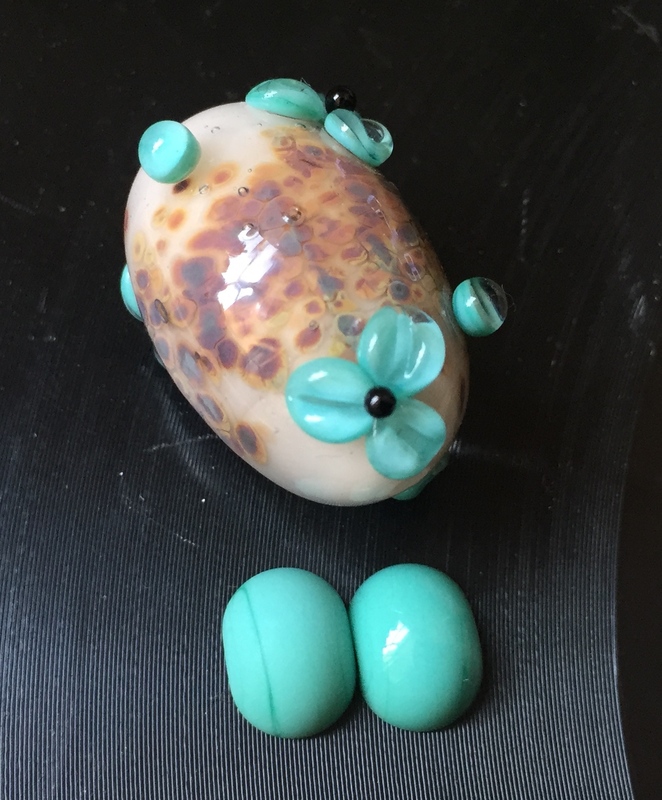 The round bead is a base of CiM Glacier, the first layer of dots is CiM Celadon. The second layer is Reichenbach Raspberry and the third layer is Effetre Super Clear. The raised dots are Effetre Dark Violet. Celadon rods like to be heated up properly at the top of your flame before introducing it lower as it will ping and crack if thrust too quickly into heat. Which is a good clue about the glass, heat transforms Celadon a lot. Celadon striates when used as a base bead. Celadon dot decoration does not striate. With careful, gentle heating; Celadon dark striation lines can be minimised, instead what appears can be best described as a “mottled” effect. To minimise the dark striations and to achieve the mottled effect; Celadon requires a slow, cool and even heating and to apply all your glass at once. 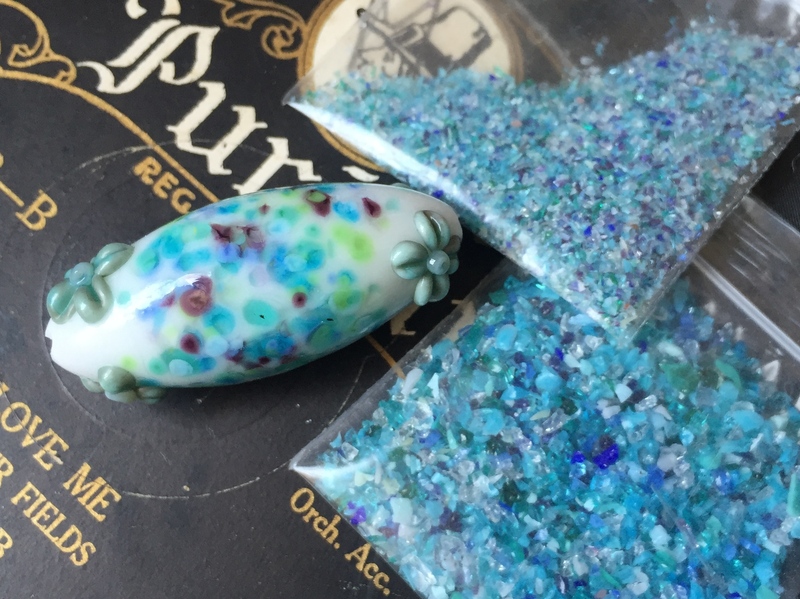 So melt a big gather and resist the temptation to make the bead larger by adding more glass. Repeatedly heating and cooling Celadon in the formation of a bead, such as using marvers, brass presses and forming trays and then blasting the bead with heat will develop striations. If Celadon is heated rapidly whilst actually forming the bead, then that too will cause it to develop these striations. If the bead was created in concentric wraps you will develop extremely dark concentric lines around, which can actually be used as part of the design (see picture above). 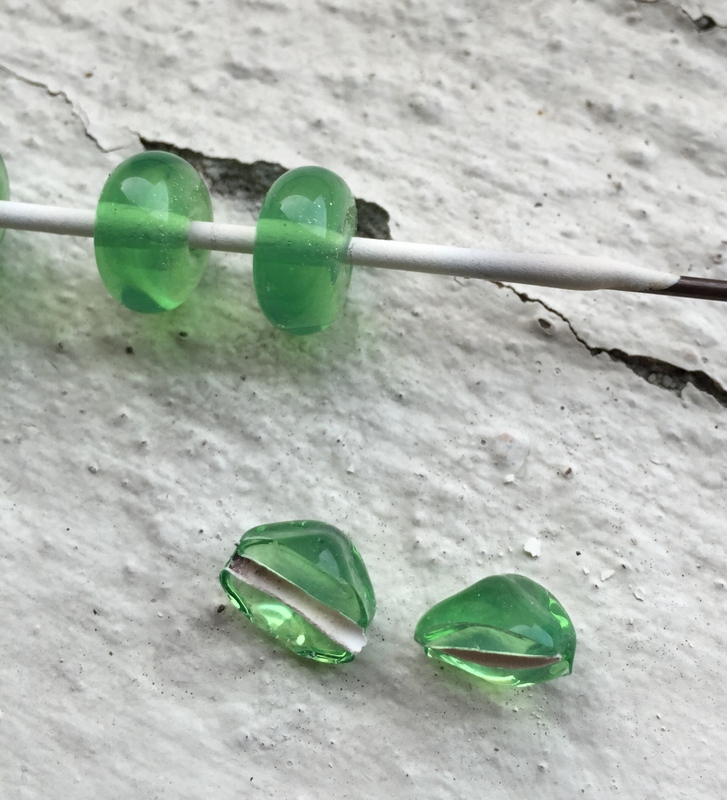 Forming a bead with Celadon wraps mean that as the glass melts and moves together a dark striation line will form where the wraps meet in the centre. These dark lines can then be dragged into patterns like stringer design. So this is something to keep in mind when you want to create a base bead with Celadon, it will create striations if you add more glass on top of it. Celadon will usually get a reaction line with orange, yellow, red and ivory toned opaque glass. When that reaction is super heated Celadon will spread a black webbing effect in that area. It is pronounced with some colours more than others. Celadon on top can spread and bleed out slightly over purple, blue and pink toned opaque glass, which leads to colour separation. Celadon is highly reactive with a lot of other glass. When I say highly, I mean that it produces effects when used in conjunction with just about everything other than transparent glass. Celadon over Effetre Dark Ivory develops a dark reaction line. Cooking Celadon into Dark Ivory will produce a brown webbing where the two colours meet. I don’t particularly like this effect, but I do think Dark Ivory and Celadon look good together so I lay down a dot footprint of clear glass so Celadon does not react. Dark Ivory over Celadon produces the same dark smokey reaction line. Most opaque glass laid over the top of Celadon will develop a reaction line or colour separation lines. What I mean by colour separation is the effect that occurs when opaque glass is wound over the top of a Celadon base. The opaque glass wound over the top will split into a lighter and darker version of itself. If it is a dot melted flat, a dark ring appears in the centre of your dot. If it is stringer decoration melted flat, a dark line down the centre of the stringer or a separation of dark and light colours occur. The key part is melting that dot or line flat over Celadon to get the colour separation. What a difference bright sunlight makes. These beads are the same as the photograph above, all that has changed is that I photographed them at different times of the day. Celadon looks a lot “greener” in bright sunlight. 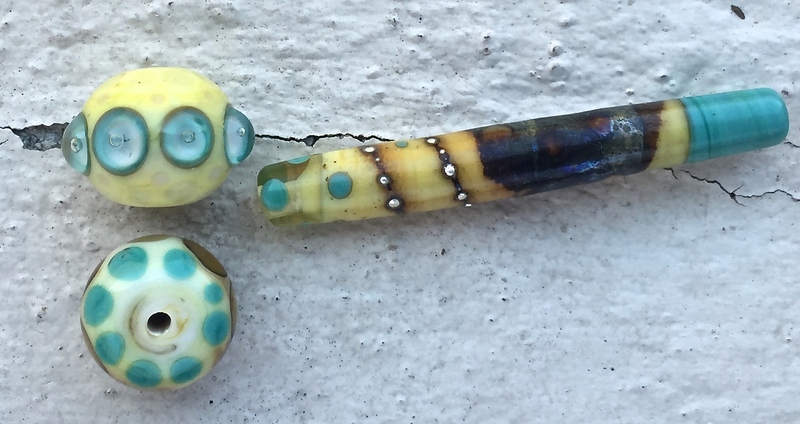 Looking at the two barrel beads in the image, both of these have been made with a tube base of Celadon and then concentric circular wraps. In addition to building the bead in wraps I also heated and cooled both beads rapidly to pull out the darkest striations possible in Celadon, as I wanted to use this effect as part of the finished design. Then I wrapped a thick ring of Effetre glass around the centre of each barrel bead and melted in. The centre wrap in the bottom barrel bead is Effetre Dark Violet. Where it met the Celadon it separated into three distinct colours. A fumed line at the outer edge, a thin dark reaction line and the actual Dark Violet colour in the centre. Three distinct colour separations was unusual and a really nice surprise. I hadn’t put these two colours together before. I reduced the bead lightly to bring more of the shine out on the Dark Violet. The bead looks more complicated than it is and I like the colour separation effect a lot. It’s handy to know that any glass with a high metal content in it is going to fume where it separates over Celadon. The barrel bead at the top has a wrap of CiM Glacier, not that you would be able to tell because Glacier has separated into a pale lilac middle band and an even paler lilac outer band. 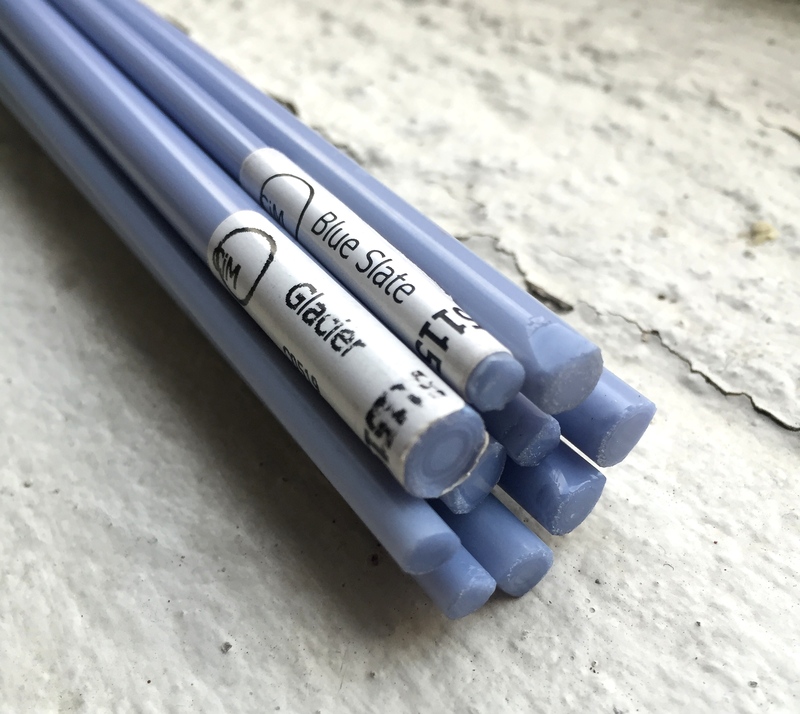 It doesn’t particularly look like Glacier, more like a pale baby blue. Again there is that slightly darker reaction line where the two colours separated, but it is not as intense as it appears with Dark Violet. Beads made with a combination of Effetre, Creation is Messy and Reichenbach glass. 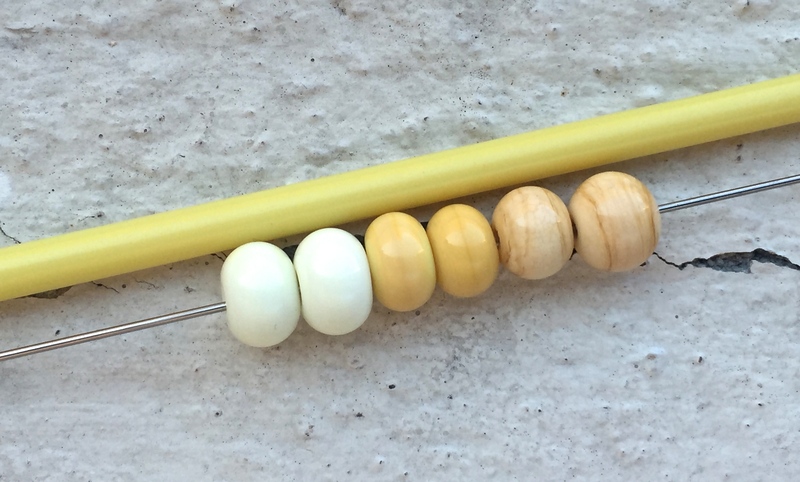 Contrast these barrel beads to the round beads. The larger bead has a base of CiM Glacier and the blue is much more true to the rod (it’s peeking out from behind the geometric dots). Layering Celadon on top of Glacier gave a tiny colour separation reaction, but that is hidden thanks to Reichenbach Raspberry layered over the top. There is very little colour separation between Reichenbach glass and Celadon that I can tell. In some of the darker pinks you can see a slight fading at the edge of dots and stringer, but that is only if they’re really melted in flat. I’ve tried with a few different colours, it seems that Reichenbach glass just doesn’t react much with Celadon. 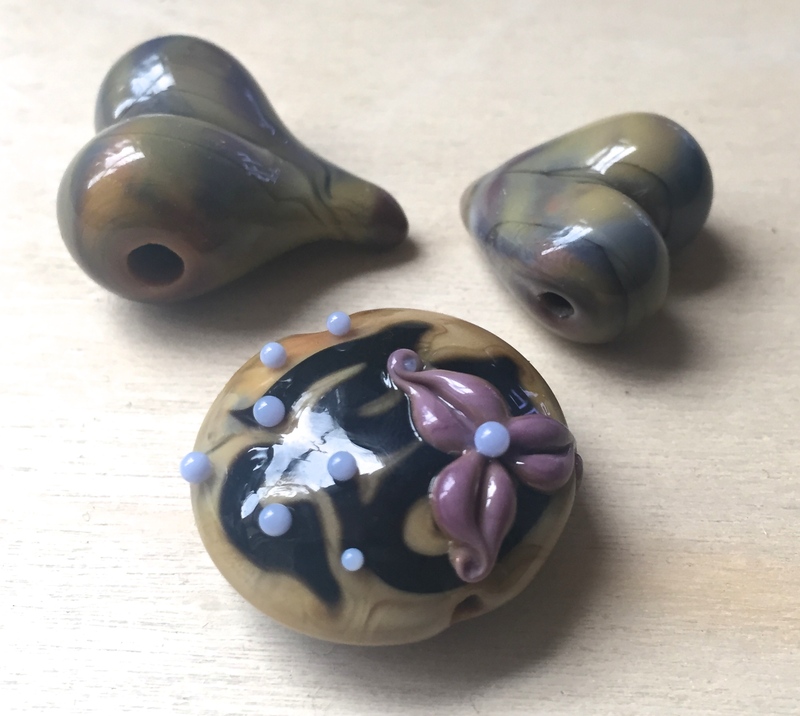 The smaller bead is made the same way except the base is Effetre Pale Lavender and the dots are encased in CiM Cirrus, which has transformed and washed out Celadon quite a bit. The unexpected twist. I do not like how Raku frit looks on Celadon when it is encased with Effetre Kelp. It goes very muddy. Going back to Reichenbach. I particularly like to use “Raku” frit and I was a bit annoyed by an unexpected reaction when I encased Celadon in Effetre Kelp. Looking at the picture shows an example of how quickly Reichenbach “Raku” frit burned out on Celadon when encased with Kelp. I blast heat my Raku, chill it, encase and I can watch Raku bloom, but that method needs to be done with care because Raku can turn muddy quickly on Celadon. I was so annoyed by the effect that I stopped making the bead, which is a shame because Kelp over Celadon is really pretty and helps fade out the striation lines. The end is a wrap of CiM Pumpkin. Oh well, I think if I want to use this colour combination I will have to be more gentle with my heating of Raku onto Celadon. Its hard to photograph the devitrification but there is a slight devit line around the edge of the Halong Bay bubble dots and Celadon. 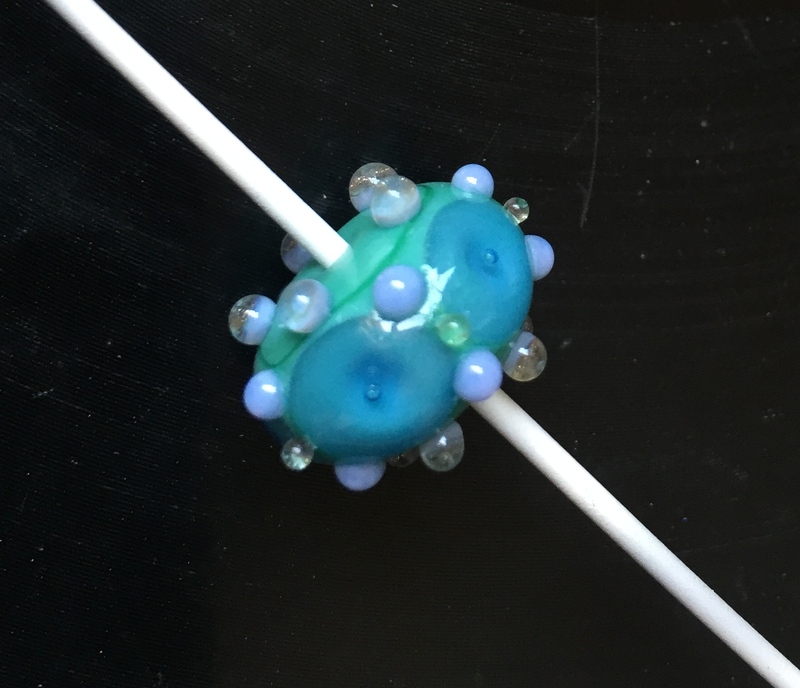 The main photo of this blog shows a devit line between Cirrus and Celadon on the round dot bead. I have noticed a propensity for Celadon to cause slight devit lines around transparent glass dots and lines that have been worked too long and hot. Because most colour separates on top of Celadon, my guess is transparent glass does too, only it’s not very noticeable. Its only noticeable when the edges of a design start to devitrify with prolonged heating. This happens very noticeably with Cirrus, less noticeably Halong Bay, and even less noticeably with Effetre transparents, so it could be something about these moonstone glasses that does it. CiM Celadon flowers (covered in CiM Cirrus) seem to glow beautifully in bright sunlight. The cracked bead below shows you two halves of the same bead, one side etched (1m 30s) and one side not. It doesn’t take much to get a full etch on Celadon using Etchall Liquid Etch. Etch Celadon. (Ha! That sounds like an order, but really… do it sometimes). Etched Celadon becomes a soft dreamy matte green. I did a test after 30 seconds in Etchall Liquid Etch and Celadon had etched just enough to give it a soft colour but not completely lose it’s shine. About the two minute mark Celadon becomes matte. Etched Celadon also strikingly resembles unreduced Effetre Copper Green (or Copper Red Green), so if you like that colour but don’t want to use a more expensive type of glass try etching your bead and masking what you don’t want etched. When etched it looks even closer to the pottery glaze it is named for. Celadon can be encased, despite popular belief that it cannot. I have encased it successfully with Effetre Super Clear, Effetre Clear, various Effetre transparents, CiM Halong Bay and CiM Cirrus. However, there is a limit to how much Celadon can be encased by Cirrus and Halong Bay, it does not like to be deeply encased in these colours. I have had no problems deeply encasing Celadon in Effetre Super Clear. I have linear encased it with plenty of coloured transparents and have not had an issue with cracking. Celadon holds a lot of heat and it takes a while for the surface to go solid enough for encasing without distortion. Take this into account if you want to encase a large bead, do it in sections and roll heat through periodically. 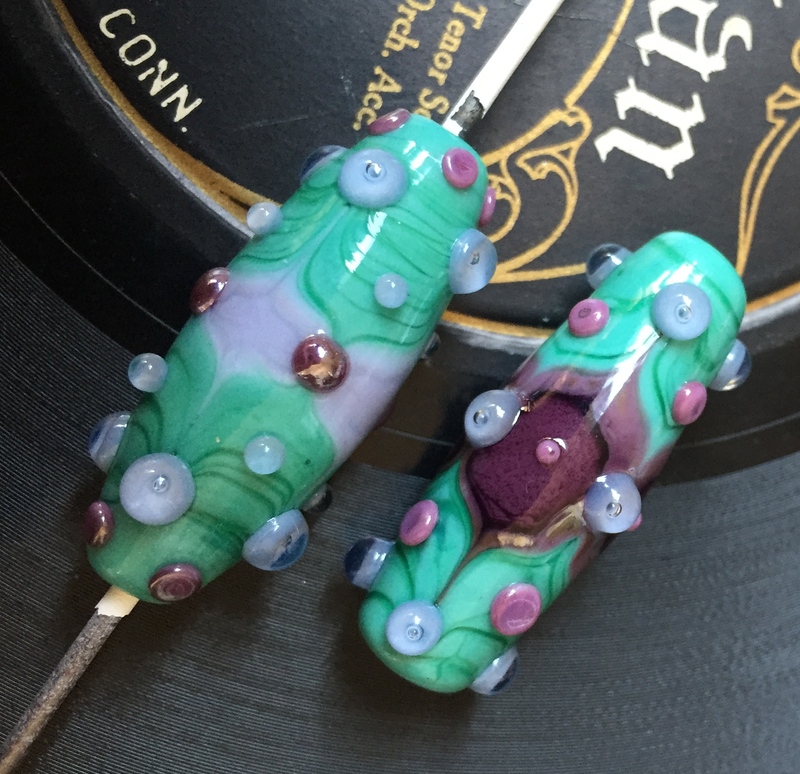 The large experiment bead at the top is made with a base of CiM Celadon, dotted with Effetre Copper Green Red and those dots have been dotted with Effetre Dark Violet Trans. The entire bead has been reduced and then encased in Effetre Super Clear. There is a gorgeous shimmery sheen to the reduced and encased Celadon. I have dots of Effetre Dark Ivory and Celadon on top to demonstrate the reaction lines. The three small spacers at the end are all Celadon reduced at various heat levels. The two mostly green spacers with splotches of red are Effetre Red Copper Green reduced. Lastly, if you reduce Celadon, a metallic red lustre appears on the surface of the bead, it is a very dramatic and a very quick shift in the flame if your chemistry is right. Gentle reduction will give you a shiny ruby red. By gentle I mean turn up the flame to a mostly long blue reducing flame and roll your bead through the top. Then watch the surface of the bead metallise in the flame, take it out as soon as you see the bead do that and you will be rewarded with a very ruby red, shiny bead. If there are some bits not quite reduced, only reduce those sections. 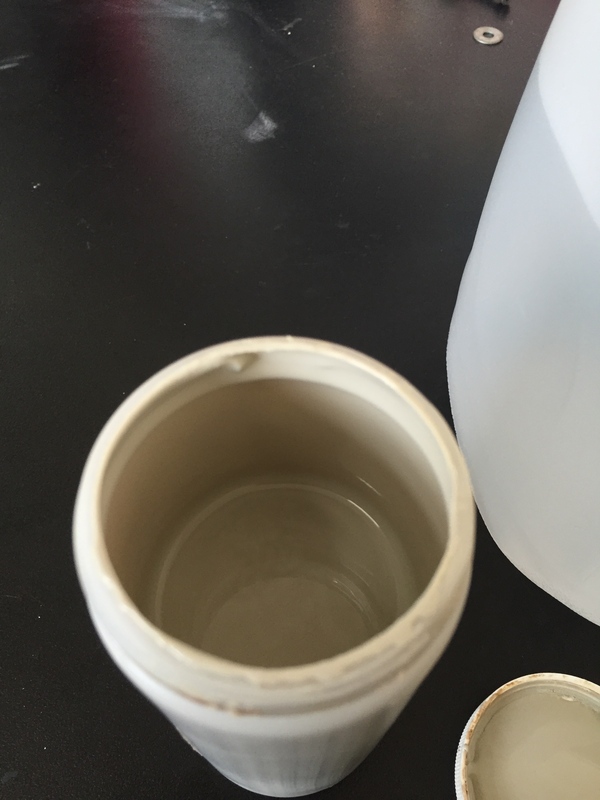 A heavy reduction will give you a more dull copper red (see little spacer bead in photo), this occurs if you reduce your bead several times or for a very long period of time (over a few minutes). 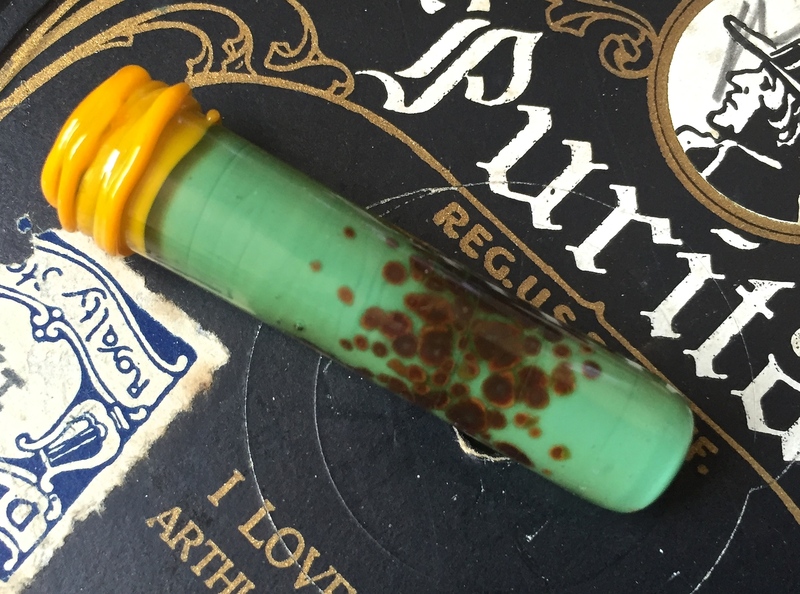 I have a video showing the difference between Effetre Red Copper Green and Celadon, these beads are all worked for the same time, in the same flame, on the same mandrel. I feel that I’m absolutely terrible at getting Effetre Red Copper Green to get an effect out of, but that doesn’t matter because I don’t actually like the red webbing effect! Lastly, this video shows you the ruby red encased bead in the photo. 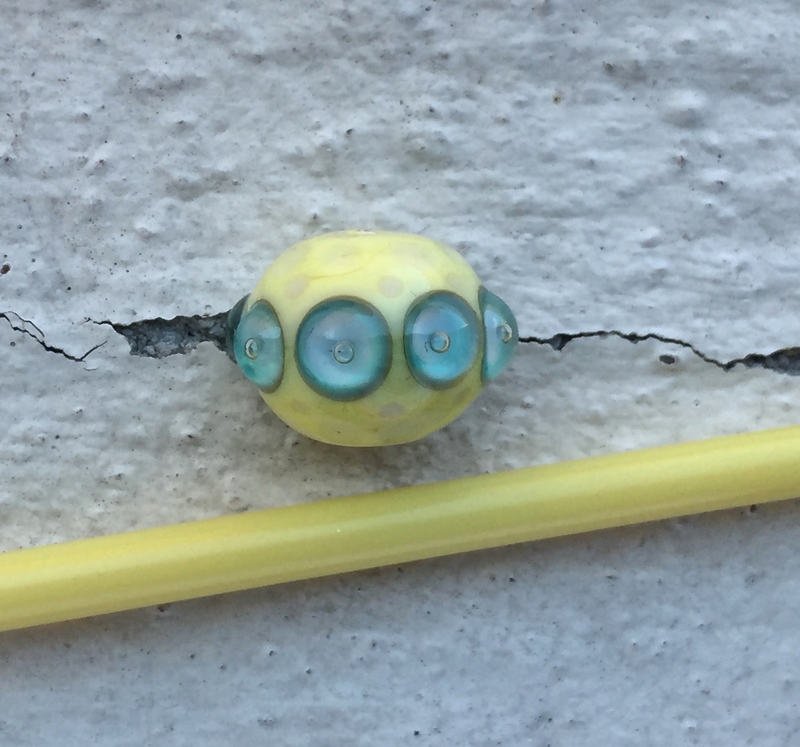 You can also mask sections of your celadon bead with clear and then reduce for a marvellous southwest style bead. Celadon is a staple colour for me, I think I rely on it far too much. I use it together with Effetre Dark Turquoise and CiM Ginger in a frit blend because of how the colours look and react together. Its such a good looking combo with anything pink, that I find I pass over Effetre Turquoise a lot in preference of Celadon. My huge Ge’&Ge’ kiln, this kiln is batch anneal only. I can get the kiln modified to add a bead door and a shelf, but it means I need to upgrade the controller. The digital controller is sitting below the kiln. This controller can only store one program in it at a time. The more programs a controller can store, the more expensive that controller (and therefore the kiln) is. 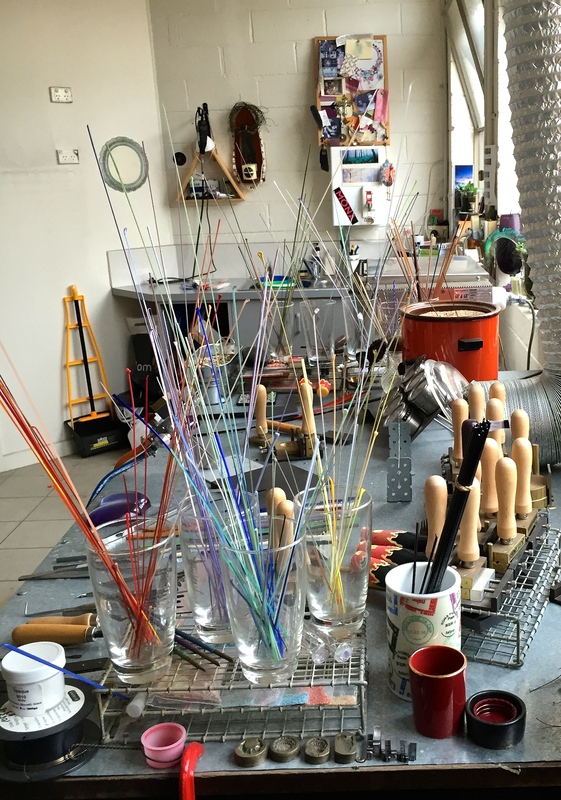 Kilns deserve a blog post on their own which is why I’ve devoted Part 8 of the Studio Set Up blogs to the topic of “choosing a kiln”. I have finally updated all the photos for this blog post (as at 5 October, ’15). 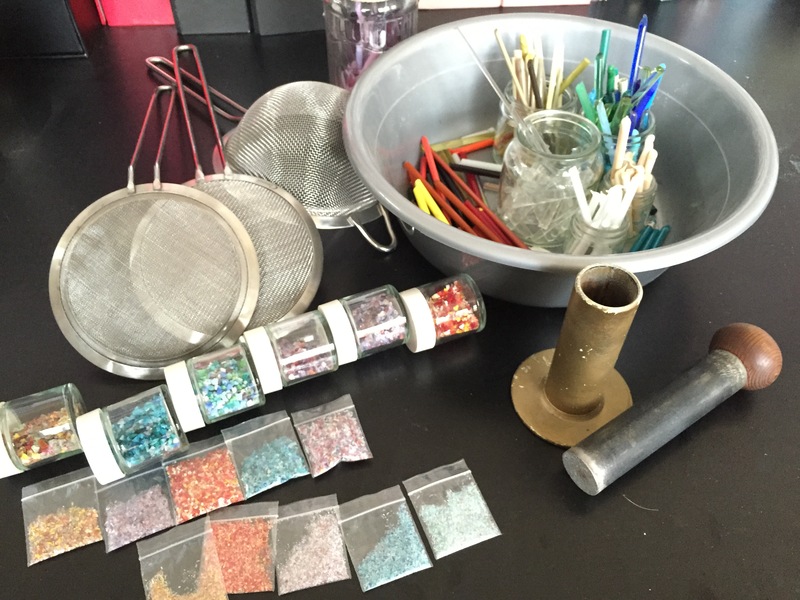 In part 7 I discussed the different tools you will likely purchase as your bead making skills improve and evolve. There will come a time where the beads you make suddenly start to look so good that you will want to wear them and when you do, the compliments and queries about where to buy your jewellery will start to roll in. Sure, everyone is proud of their first efforts but it wasn’t until my 70th even nearing up to my 100th bead that my artistic style really developed and talking with other artists, this was about right for them too. About that stage of your bead making career you should consider purchasing a kiln to ensure the longevity and saleability of your beads. For some people it might be three months into bead making, for others three years. 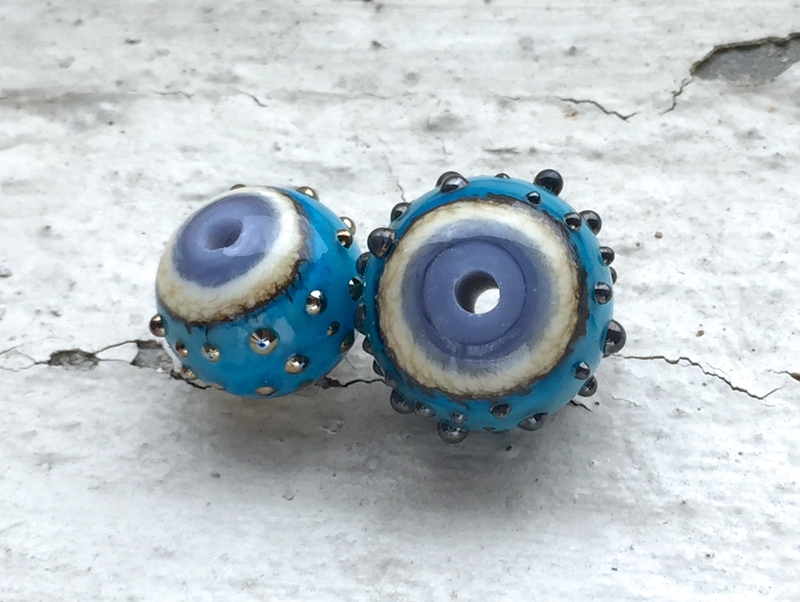 Yes, you can get away with not annealing your beads, ancient beads are popping up everywhere thousands of years old and they weren’t properly annealed and are still in tact. Whilst a round or stubby cylinder bead is less likely to crack than any other shape and you can wear these beads without much fear of them cracking, other bead shapes require annealing. Glass is a fragile product and annealing takes away some of the fragility. So what’s with the whole annealing thing anyway? 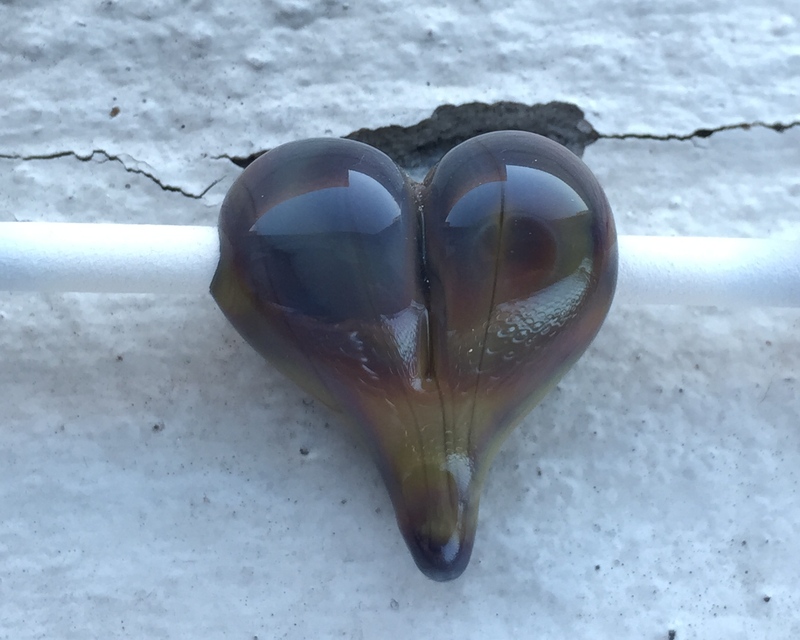 Why do glass workers need to fire their beads if they want to sell them? That question has been answered in detail through this wonderful blog by Everlyn Durberry. 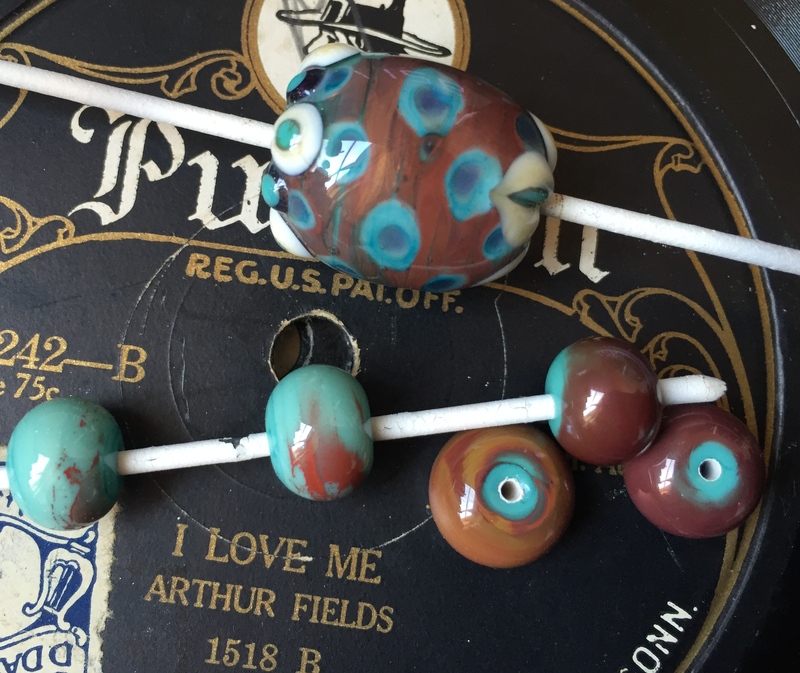 If you are going to sell your beads, anneal them properly in a kiln to guarantee your work. In short, if beads are butted up against other glass beads or the beads are in a bracelet which gets a lot of knocks, the chances of glass beads chipping and cracking are pretty high if the beads are not kiln annealed. Most mass produced beads from China and India are not kiln annealed, which is why you’ll often see broken and chipped beads in jars and containers in bead shops. When you raise glass beyond it’s stress point and hold it at a set temperature for about an hour, something magical happens; glass becomes stronger and more durable. Round glass beads will bounce off concrete without a chip, scratch or fracture line. I’ve got a necklace full of raised dot beads that I accidentally dropped, they bounced off the concrete and scattered all over the floor. That was five years ago and the necklace is still going strong. 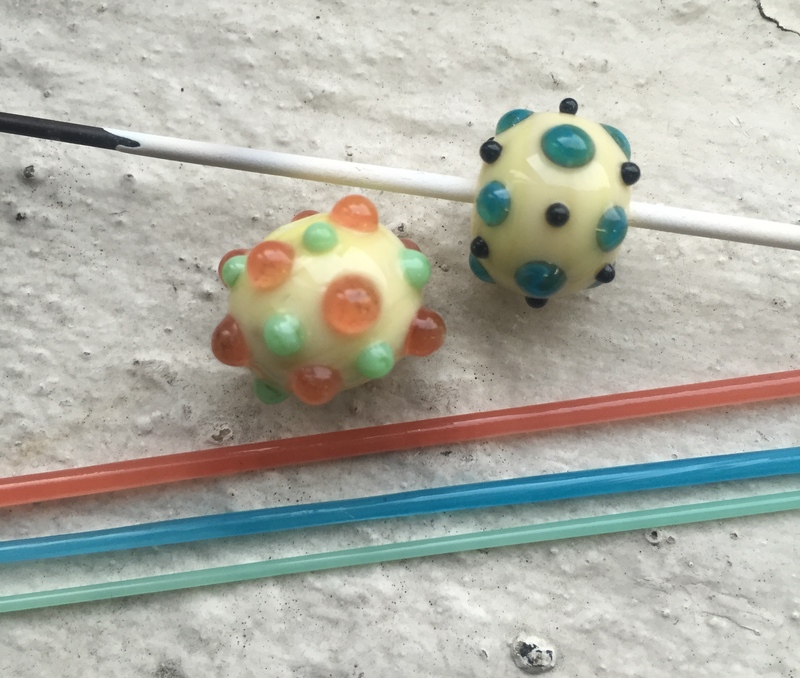 However, glass is glass and whilst round beads are more durable than any other shape if you aren’t careful with your beads they will break if dropped no matter how well annealed they are. If you’re intending to sell your glass beads to other jewellery makers, you want to guarantee your work and they want to be able to guarantee theirs. If you’re making jewellery to sell, the same principle applies, kiln annealing properly is important because it’s your quality guarantee. This is a basic controller, it’s about ten years old so this model has been superseded. At the moment it is switched off, when it’s running the current kiln temperature shows in red, and the ramp rate, hold temperature, cool temperature shows in green. Most controllers have this colour configuration. What is the difference between annealing and flame annealing? Annealing is a term used in both metal and glass industries. When you anneal an object you are slowly raising the object in temperature to just beyond it’s “stress point” – which is a type of melt point that removes any internal stresses within the object. The idea is to hold the object at just beyond this stress point for a period of time to remove any pressure inside the object. Then the item is left to cool down very slowly and this action will strengthen the object and provide it with long term durability. Flame annealing is the technique of heating the bead at the end of your flame (increasing the propane slightly for a hotter flame) until it is lightly glowing red to remove any stress put into the bead, it is a type of annealing but it is not as good as putting the bead into the kiln. If you have a kiln with a bead door, you would pop the bead straight into your kiln (which will be standing by at a hot holding temperature) when you’re done working for the day, you will set the kiln into it’s ramp up to anneal temperature and ramp down mode. 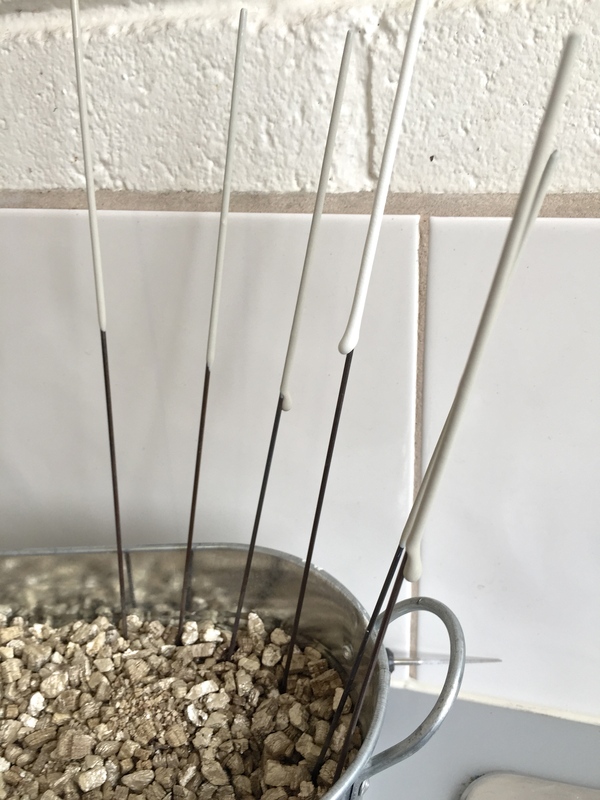 If you are batch annealing, you will rotate the bead out of the flame until it loses it’s glow and then place it in a fibre blanket or heated vermiculite to cool down slowly. After which it will go through a more strenuous annealing cycle once it has cooled down. When you have made a lot of beads and they’re all cooled down slowly in vermiculite you will run your kiln through an annealing cycle. Here’s the thing with kilns, like torches, you have to find one that fits you. Kilns can be made from fire brick and/or fibre blanket and lampworkers need to get one with a digital thermostat controller otherwise you have to spend all day babysitting the kiln temperature. Try and get a kiln with a bead door to save yourself having to batch anneal. 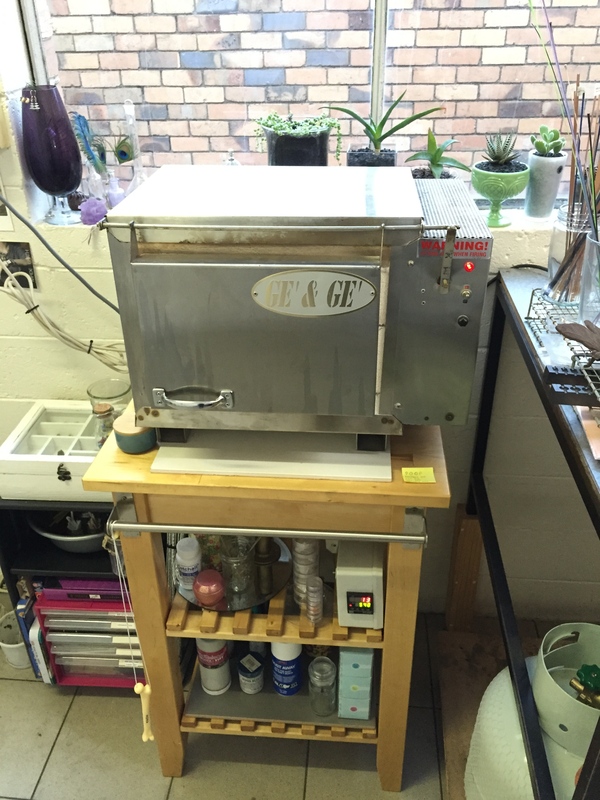 I bought a “batch anneal” kiln because at the time they were much cheaper than those with a bead door. I don’t mind having this sort of kiln. I can use it for multiple purposes like slumping cabs and fusing. At the end of the day you’re going to buy something that fits your budget. In the back of your mind you should be looking to buy a kiln in a size that suits your needs with a quality digital controller that can be programmed. That may mean you get a kiln with a bead door and a fancy controller that can be programmed in a number of ways. However, if you don’t have the money and you cannot afford the bead door luxury and you think you will be buying a kiln for batch annealing with a simple controller, read on. I talk about my experiences batch annealing. My kiln is made of firebrick, I haven’t bothered to kiln wash it because I haven’t been slumping anything in it. The bricks are “glued” with a special type of cement and the door is heavy reinforced steel and firebrick. 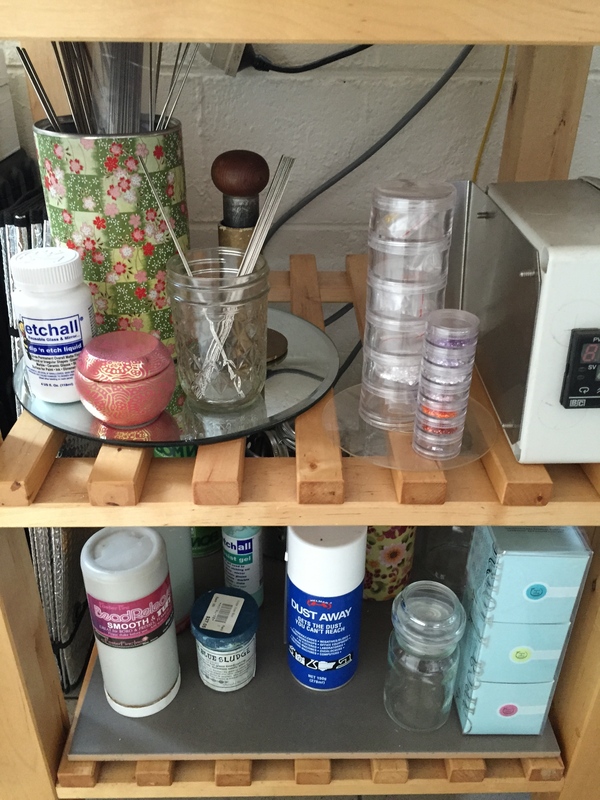 You can put a rod rest and a shelf into big kilns to pack in the beads. But my usual trick is to do this. If you flame anneal and cool down your beads slowly they shouldn’t break and you can wear them (I wouldn’t sell beads that aren’t fully annealed). If you have been given a kiln or you bought one with your torch, the best thing you can do is follow the digital controller manufacturer’s instructions to set the ramp up, hold and ramp down program (if you can’t find the instructions, google the brand; a lot of manufacturers have their instructions available for download in a .pdf format). If you have a pottery kiln that doesn’t have a digital controller, don’t risk firing your beads, you could slump them, or not actually anneal them properly. You can get pottery kilns altered with a programmable digital controller (links to the bottom for Harco controllers in Australia). 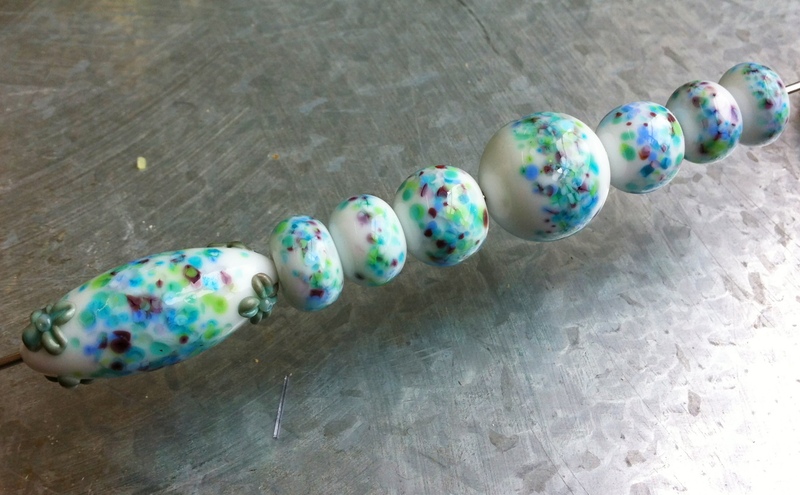 There are kiln firing schedules for glass beads available on the internet. I have a basic one listed below, which you can modify to your needs. When I say modify, what I mean is, different types of glass require different annealing schedules. For instance, my schedule is for COE104 glass, but you will need a different ramp and anneal schedule for Bullseye COE93, Satake (Soda Lime) COE113, Satake (lead) COE120, Gaffer COE96 and etc. To read more about different brands of glass, check out this detailed blog post by Robin Snuttjer. This kiln is fitted with a kill switch, if the door is raised the kiln will stop heating. (Which is what the warning sticker says). The kiln has just been switched on and is full of beads, the internal temperature is 13 degrees Celsius. It will slowly raise the temperature over the course of three hours. 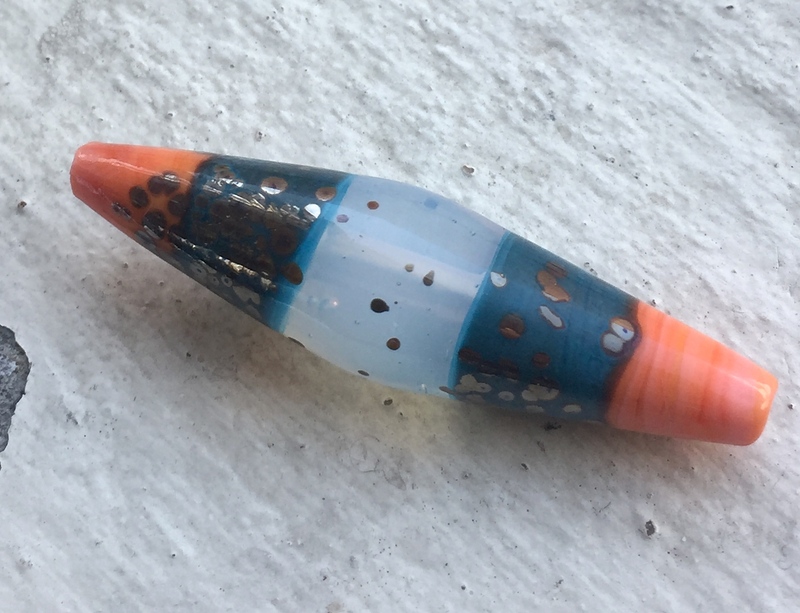 With an annealer, you need to make sure your kiln is at the correct holding temperature before beginning your bead making session, you can ramp your annealer up really fast, but you can’t do that in a “batch” annealing kiln; your beads will crack. Is my annealing good enough? Kilns are used to raise the temperature of a bead and hold it for a length of time beyond it’s stress point to eliminate any hidden stress fractures. All glass kilns do this, no matter the type. 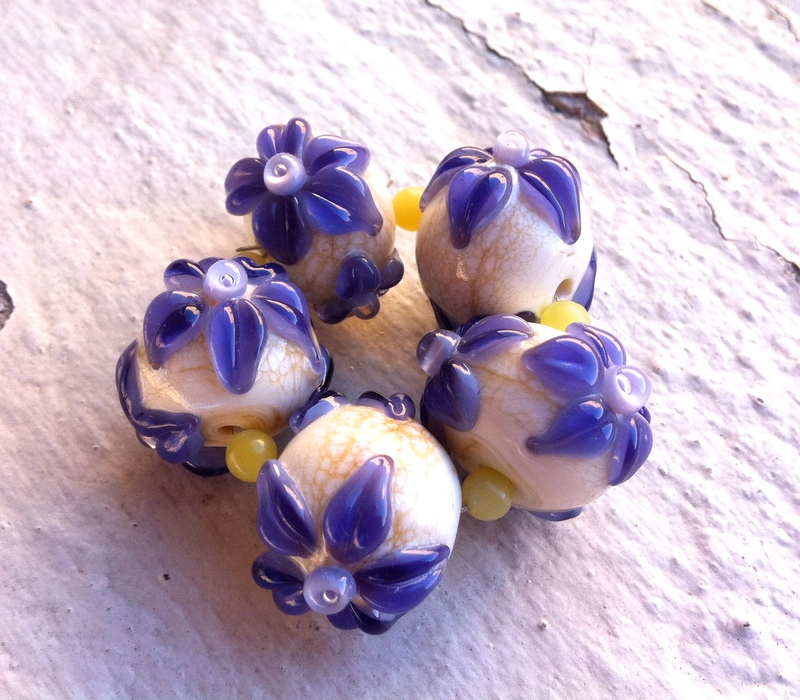 Firing your beads in a kiln to a proper firing schedule guarantees long life of your beads. 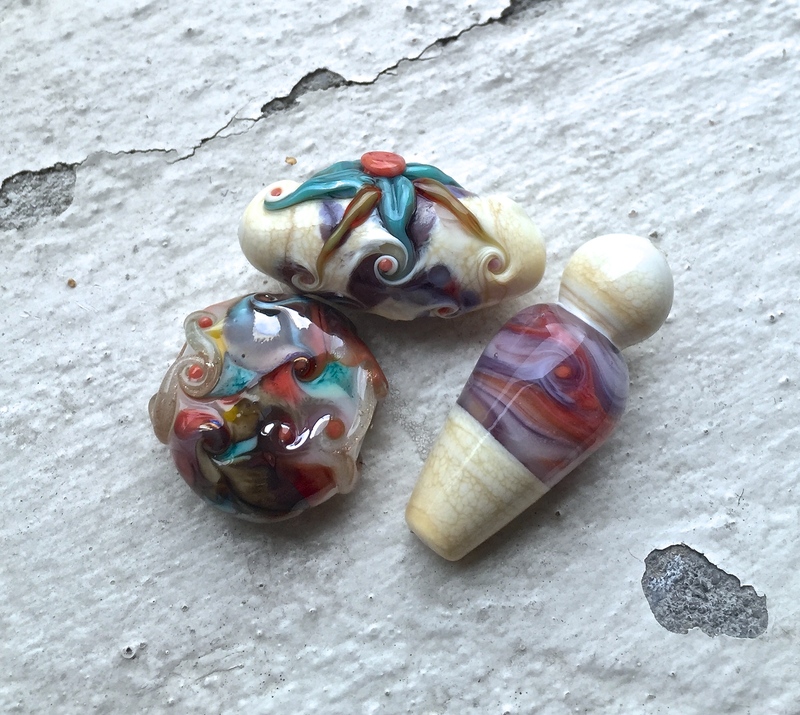 The general consensus by lampworkers is that the best way to make sure beads are strong is to go from “flame to kiln”. I don’t necessarily agree that it is the best way to fire your beads, but it’s the easy hassle free way. “Flame to kiln” certainly eliminates the risk of breakage from improper flame annealing. “Batch” annealing means you have to flame anneal properly because you will be cooling your beads down slowly first. Then you need to be careful about putting your beads into a fibre blanket or pot of vermiculite. “Flame to kiln” means you are less likely to crack beads from cooling down too fast in vermiculite or a blanket. 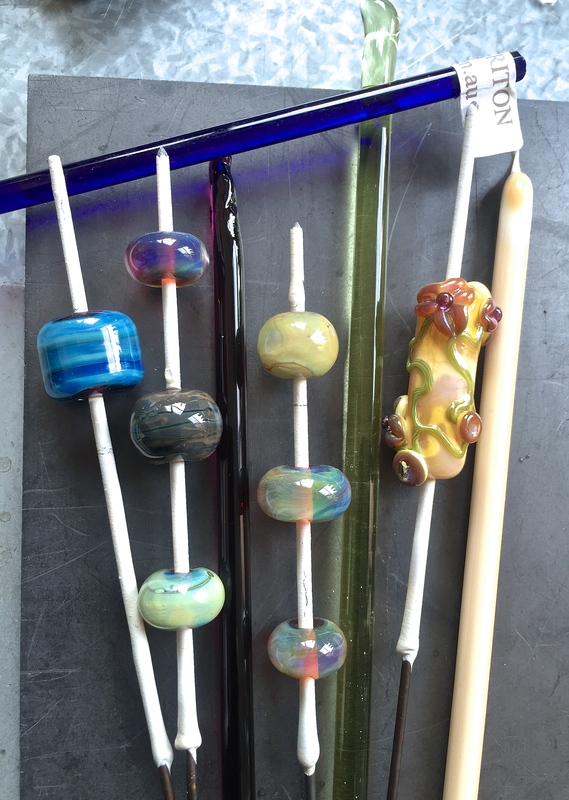 Both “flame to kiln” and “batch” annealing methods will anneal your beads properly. “Flame to kiln” eliminates the cool-down step which is where most errors are made. If you are careful and patient, “batch” annealing will be fine for you. Don’t think that if you can’t afford the super duper expensive kiln your beads will somehow be less than wonderful. 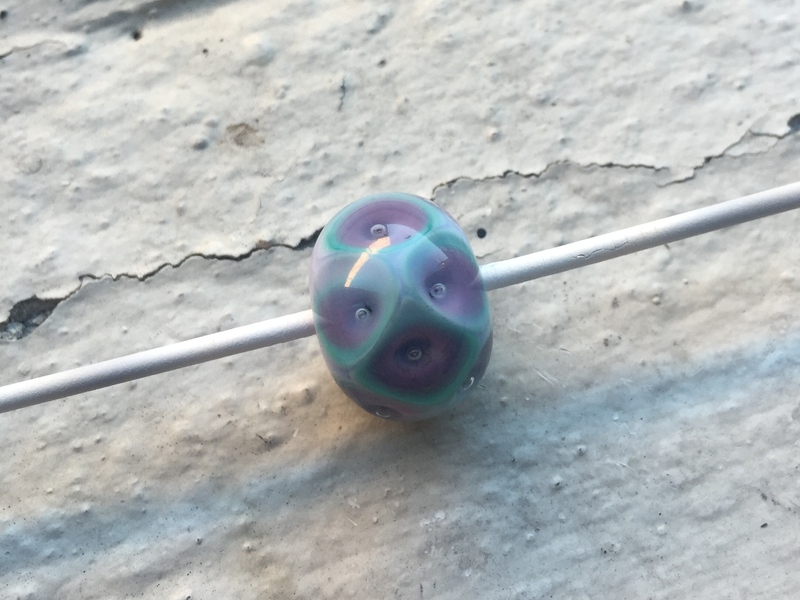 If you have a lampworker friend nearby you can always send your beads to them for batch annealing whilst you save up for the kiln of your dreams. That way your bead sales can help fund your new kiln purchase. The groovy 1970s era crockpot filled with vermiculite helps cool hot beads down before batch annealing. What is “strain” or “stress” point temperature and why is it important? I work primarily in Soda Lime glass COE104. If you are working with lower coefficient glass, annealing temperature will be higher. As a general rule of thumb COE104 glass will anneal at 515 degrees celcisus (960F), this means that if you are using a kiln with a bead door you will want to “garage” the glass between 30-40 degrees lower than your anneal temperature to remove any stress in the glass. So anywhere between 920-930F and about 485-495C should be your garage (strain) point. Bear in mind that I make beads up to 4in long and up to an 1in wide so I do work at the higher end of the firing scale, also my kiln is huge. If you are batch annealing, depending on your controller you will be able to ramp up, stop at the garage temperature (strain point), then ramp up to the annealing temperature for an anneal cycle. (My kiln controller cannot do this, so I must flame anneal carefully before putting my beads into a straight ramp to annealing temperature). 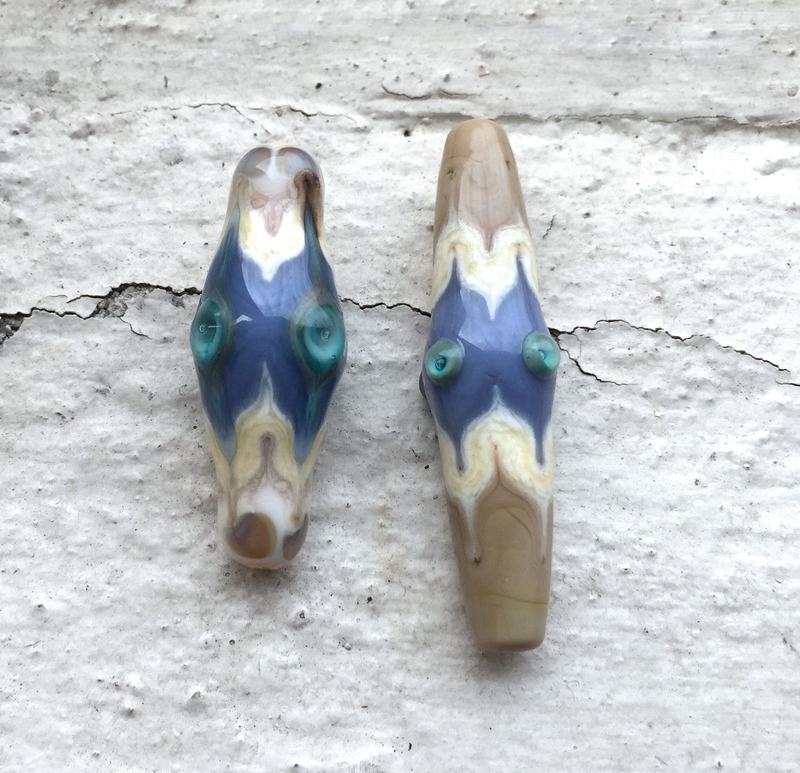 These beads on mandrels are between 2 and 4in long and up to 1/2in thick. These go in my “2 day” cycle. That means, they cooled down in vermiculite overnight then into the kiln completely cold the next day for the 10 hour cycle. A ramp up of 4 hours, hold for 3 and ramp down of 3 hours and I take them out the following morning. 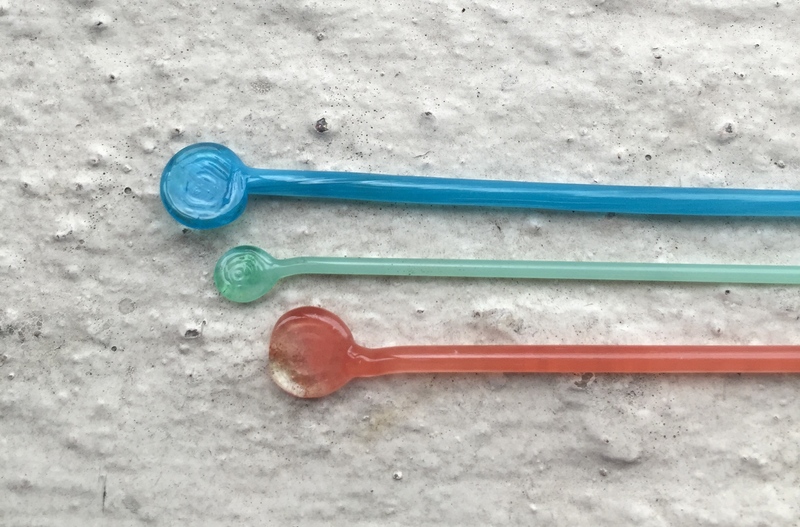 Soda Lime glass is usually annealed for an hour at 515c, but you can raise the anneal temperature slightly and drop or increase hold times depending on your kiln size and bead size. If you make large beads, it’s always better to slightly increase the anneal temperature to accommodate the thickness of them. Or you can go the other way and increase the annealing time. (I prefer to go slightly hotter and anneal for a little longer – only an extra 10 minutes). You don’t want to go beyond 545 degrees celcius for COE104, because raised designs, faceted and pressed beads will lose their crisp edges as Soda Lime will begin melting beyond that temperature range, if you are using Satake glass pay particular attention to annealing temperatures as it is much softer than Effetre. For those of you that have kilns with controllers that can cope with stepped programs, one other trick is to bring the kiln out of anneal and stop it for an hour at the strain point before full ramp down. The idea is that with larger pieces of glass art, the second stop at the strain point puts the kiln into a position where the heat is evenly distributed and allows for any stress put into the glass that was not removed the first time (before annealing) to be removed. But I heard that you can’t encase this glass? 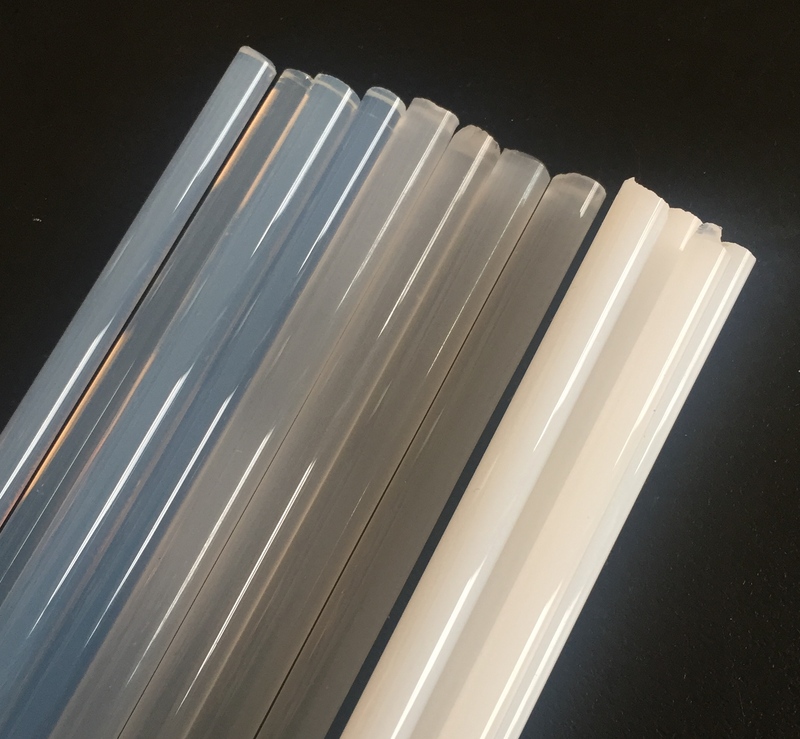 For temperamental glass (glass in the 104 palette that appears “incompatible” when encasing it) the advice from glass manufacturers is to raise your anneal temperature by a few degrees and increase the anneal time by 5 minute intervals. For instance, so many people tell me that they can’t encase CiM colours and I find that to be not quite accurate. Some CiM glass cannot be encased at all, just like some Effetre and some Vetrofond (and so on). However, most of it can be encased just fine when you increase your temperature and soak times. I never have the issues that others have with CiM because my kiln runs a bit hotter and longer than is necessary to anneal glass. There is no “set and forget” scheduling if you’re mixing up brands of glass and changing your style around. 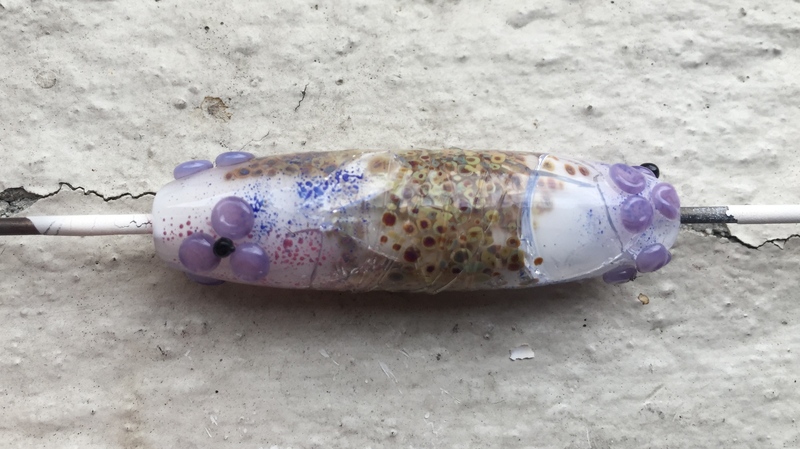 There does need to be a bit of flexibility on your behalf to be ready to fiddle with your kiln controller settings if you decide to go suddenly from making very small beads to large ones, or to encasing beads when you didn’t encase previously. Like baking a cake, each oven is different, each cake is different so you will need to adjust your firing schedule to suit your purposes. What is “flame annealing” ? Flame annealing is the practice of heating the bead up evenly at the very tip of your flame to distribute heat evenly through it before putting the bead away into a kiln, fibre-blanket, pot of vermiculite or pot of annealing bubbles. Some artists like to turn up their propane slightly to do so. I am in the habit of keeping the flame neutral so that I do not have any unintended reactions occurring in my finished design. It is extremely important to flame anneal for those of you who are “batch” annealing. Missing this step means that you will get beads cracking in your cool-down phase. I rotate large beads for up to five minutes at the tip of my flame before garaging them in vermiculite. If I forget or think I can wing it on a small bead or do not flame anneal a large bead for at least five minutes, its a certain guarantee that I will develop cracks in my beads. If you are using vermiculite, it is extremely important to heat it up first; vermiculite stores water. If you live in a humid environment over time your vermiculite will absorb water from the air around, this in turn will impact the beads that you bury in there to cool down slowly. You can see all the condensation forming on the glass lid of the crock pot. It turned out to be two tablespoons of water. I usually heat my vermiculite up for a few hours when I’m torching without the lid on, but once a week I put the lid on to see if any moisture is still in there. After my beads have been flame annealed then cooled down slowly in vermiculite. I pop a big batch of them all into the kiln ready for kiln annealing. My kiln has a ramp up schedule of 5.5 degrees celsius a minute (330C an hour), holding at 45-60 minutes (depending on the bead sizes, I run big beads longer) at 535 degrees celsius (995F) before ramping down at 2.5C a minute (144C an hour). This isn’t a programmed ramp down as my controller cannot do that. Once the anneal temperature is reached my kiln will stop heating and cool down very, very slowly. I usually just let it run overnight and then turn the kiln off in the morning. I run my kiln slightly hotter because my kiln is so large, I found that a 515 annealing temperature was too cool for both the beads that I make (usually really big beads) and the size of the kiln. One day I sat around and measured the rate the kiln lost heat because I was trying to figure out why a lot of my beads were cracking. I worked out that one reason was because I was not flame annealing properly, I roll my bead at the end of the flame for a good 2-5 minutes before putting it into a pot of heated vermiculite now. Flame annealing is my guarantee of reducing stress fractures in long and thin beads, pressed beads and shaped beads (like “Goddess” beads). The other part of the reason for my bead breaks was the kiln schedule I was using. I had programmed a stock standard schedule that I found on the internet, but what I didn’t take into consideration was the fact that my kiln is SO HUGE that the firing schedule was not annealing my beads hot enough or long enough. So now, I run my kiln slightly hotter than most bead firing schedules you will find online to accommodate the quirks and size of my kiln. I’ve drop tested a lot of beads since changing my program to the one specified above and I’ve had no breaks since. 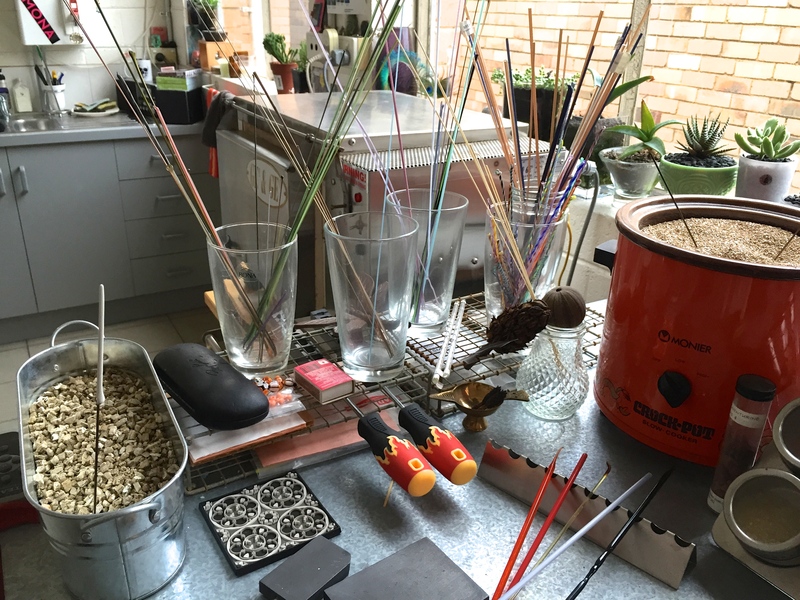 If you have a big kiln (the inside of my kiln is 40cm x 40cm x 40cm) go with a slightly hotter anneal temperature and soak for 45-60 minutes for every inch of thickness in your bead. For example, my four inch long by one inch wide barrel beads anneal for about four hours. You cannot “over anneal” your beads, so it doesn’t matter if you also have half inch round beads in with the big four inch beads. 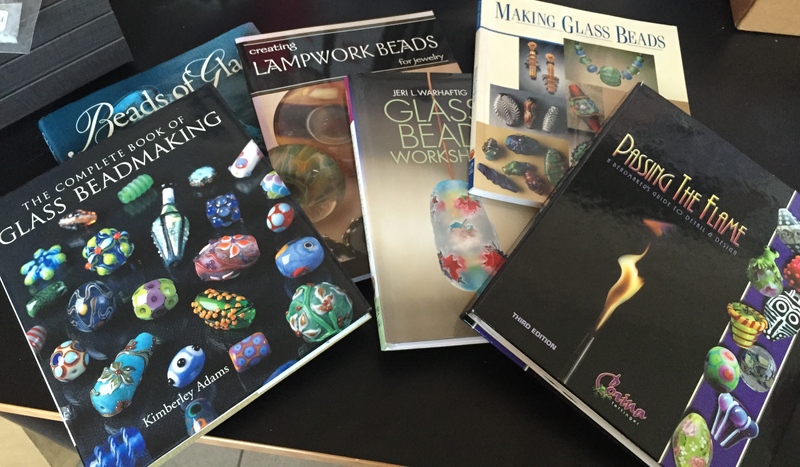 If you want more information about glass annealing, I recommend reading Bandhu Dunman’s Contemporary Lampworking books. 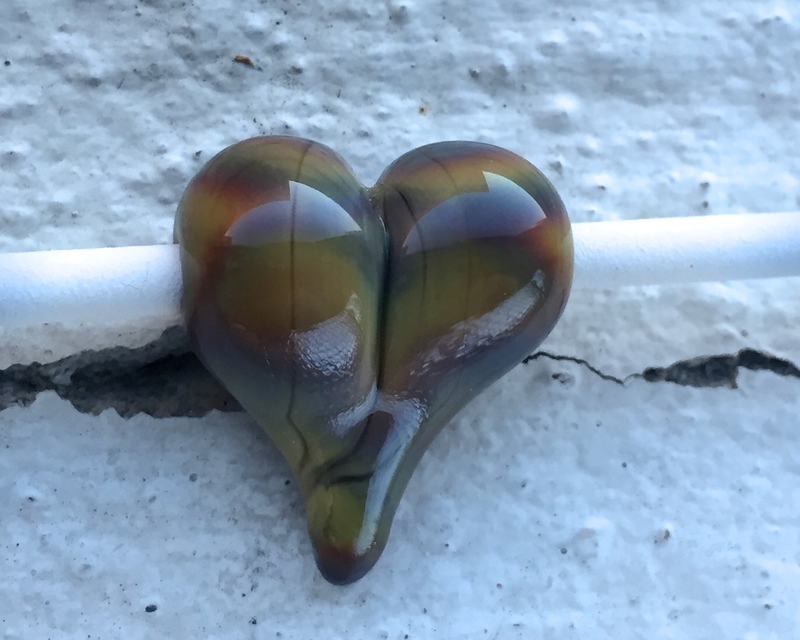 If you are having problems with beads cracking when you accidentally drop them or even after a few months of wear, look at how you work before going out and buying a new kiln, or blaming a particular brand of glass. The artist puts stress into the glass, we can remove the stress if we change some elements about how we work. The kiln schedule can remove a lot of stress if you are stopping at the strain point for long enough before going into an anneal cycle. Annealing cannot remove the inherent stresses in badly constructed beads, beads with bubbles along the length of the mandrel hole (a poorly made first wind), beads that have been allowed to cool down too quickly outside of the flame, beads that are too thin on one end, beads that you have let the ends go cold on, will all have a lot of internal stress. Any of these severe internal stressors will eventually crack the bead. 1. 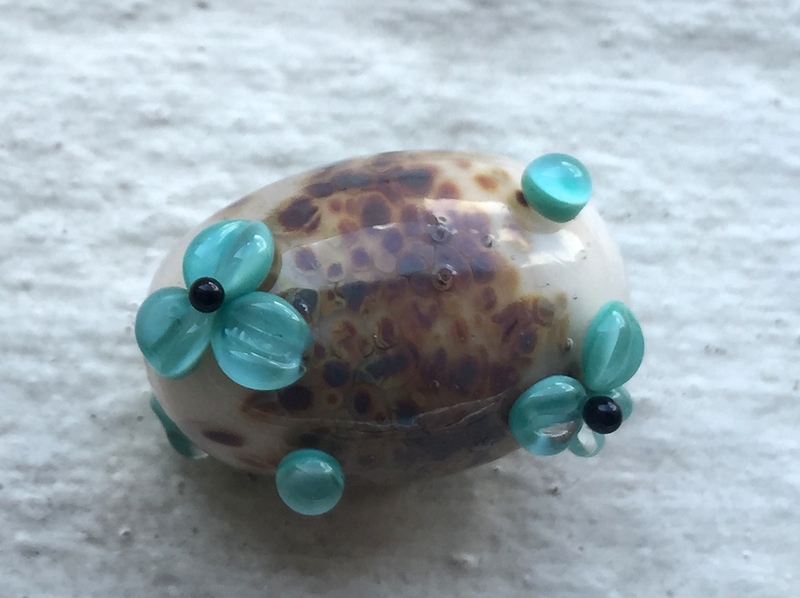 Am I putting my bead away too cold (even if you are going flame to kiln, putting beads away too cold will result in a lot of stress which means cracks down the track). 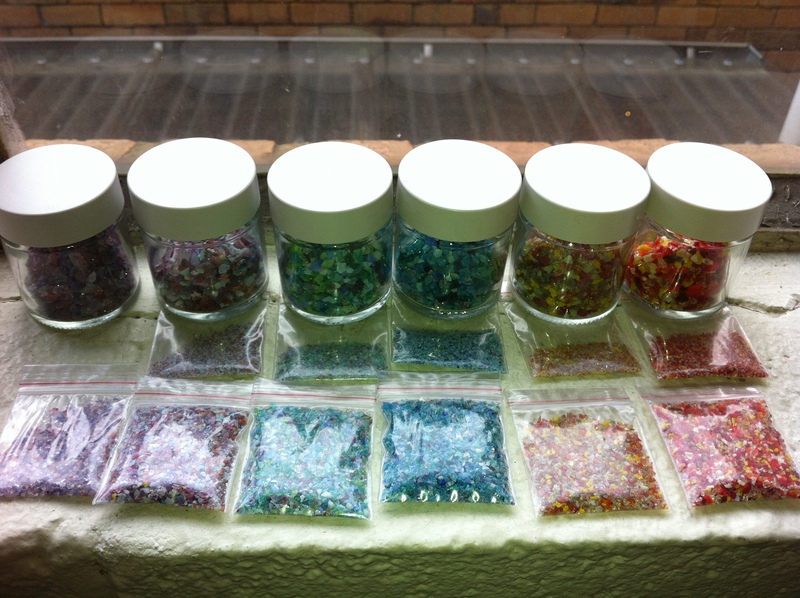 Beads should slightly lose their glow before being put into a kiln, vermiculite or blanket. 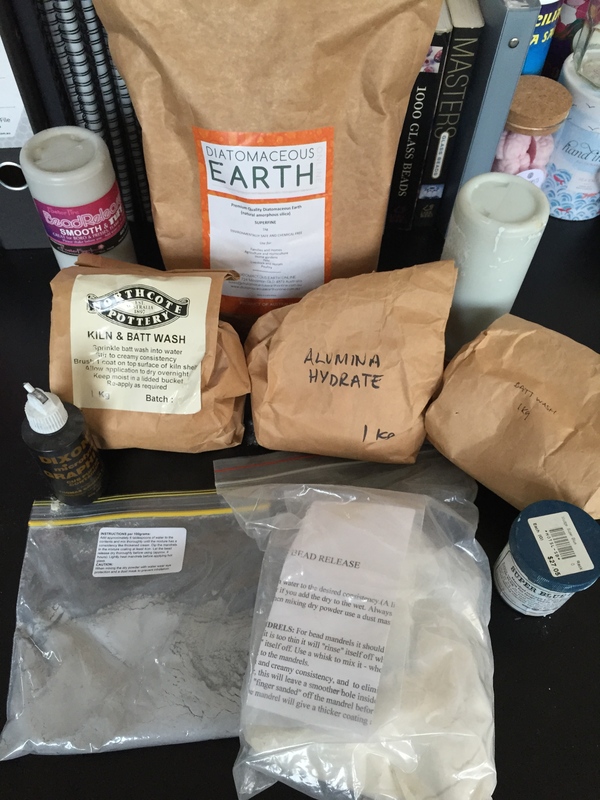 (I put the bead under the desk in the dark to see if the surface is still glowing, if you put a bead into vermiculite (or fibre blanket/bubbles) too hot, these products will stick to the surface, distort or imprint on the bead. 2. 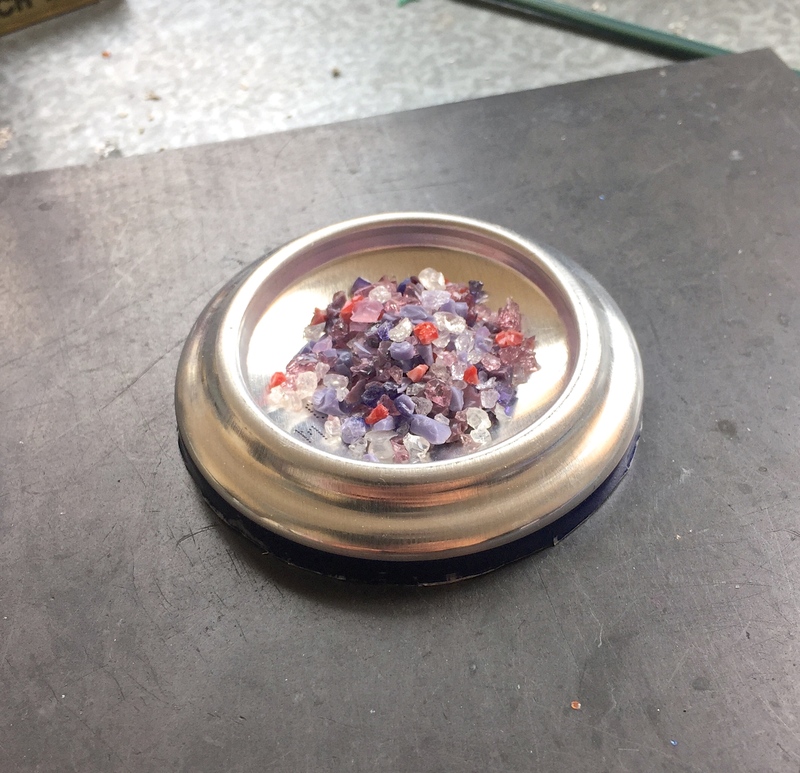 Am I flame annealing and keeping the bead warm as I work? Beads heat from the centre outward, the edges of beads get cold before the middle (yes, even on a round bead) Beads with ends that are rapidly colder than the rest of the bead will crack if they go into a pot of vermiculite. So be mindful to roll heat through a bead as you’re working on a design. If you’re going flame to kiln, you can probably get away with having cold ends. 3. 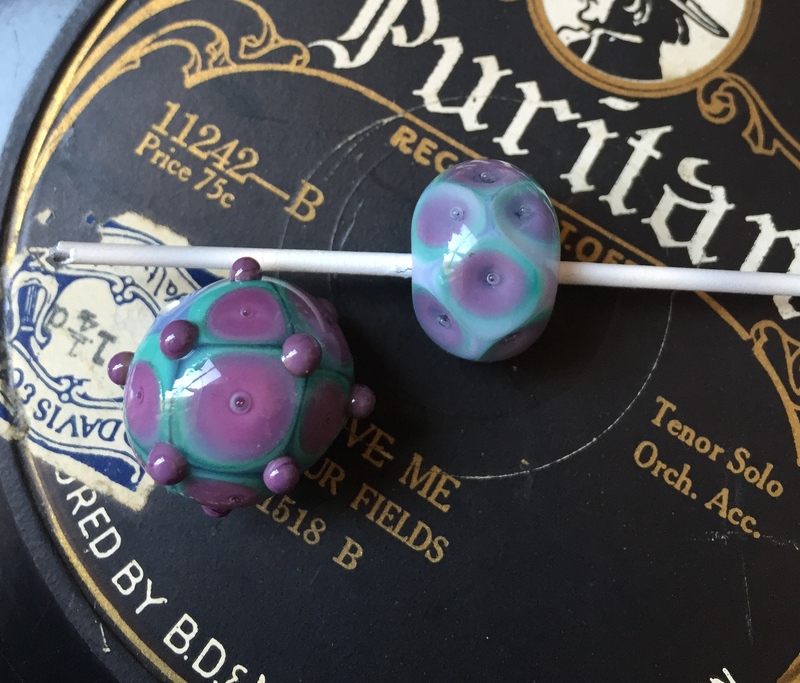 Is my kiln temperature right for the beads I’m making? Most of my beads range between 1in and 3in. I make big beads and big beads need a slightly higher anneal temperature and anneal soak length. I still make mistakes though, recently a very big bead came out of the kiln cracked and I know that it was because it cooled to quickly coming out of the program. This is a limitation with my kiln, I cannot hold at a second strain point. 4. Experiment with your controller and get to know your kiln. Keep notes and test your kiln regularly, you may get cold spots in it. The bead on the end was pressed, but not heated enough after pressing. When it was placed into the vermiculite to cool down it developed a crack. This is one of the pitfalls of batch annealing. Batch annealing offers the same durability as flame to kiln annealing. Round beads that are flame annealed and cooled down properly will last a long time as they are. 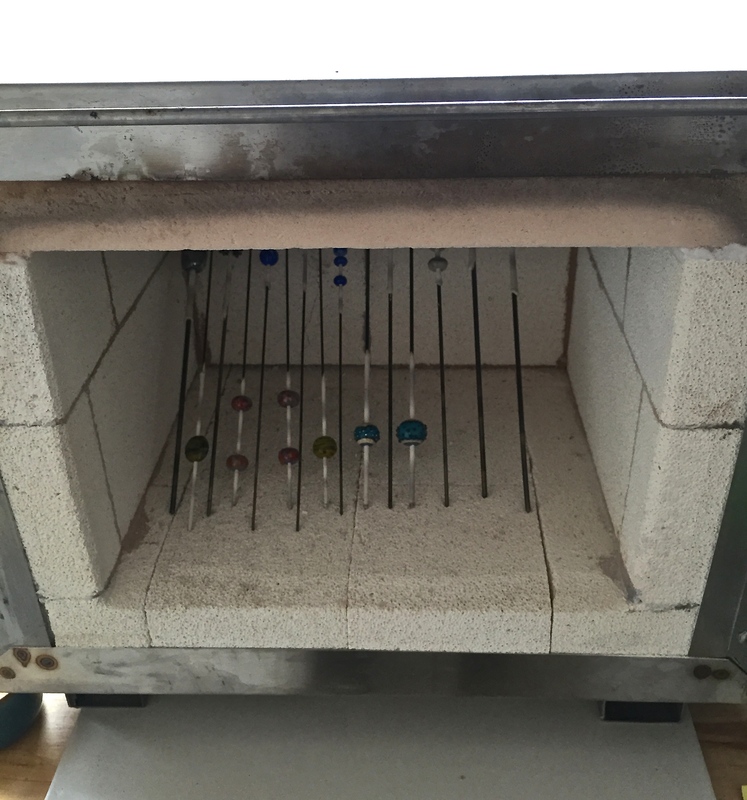 If you have purchased a kiln with no bead door (like I have) you will be batch annealing your beads because you cannot go from flame to kiln. This means you will need to purchase a fibre blanket or crockpot and vermiculite. Vermiculite is a natural insulator and it’s very cheap. It’s great for slowly cooling beads down in. I prefer vermiculite to a fibre blanket and I don’t use annealing bubbles because they’re hard to get in Australia, but my understanding is that they work in the same way that vermiculite does, with less dust. I also prefer to have my vermiculite heated up as I am less likely to have beads cracking in warmed vermiculite. The stuff is mostly sold in 100litre bags, whatever you don’t use can be mixed into your potting mixes or used for hydroponic cultivation (it also absorbs water and can be used to keep plants hydrated). Some companies sell vermiculite in a small size bag, always purchase a small grade size of vermiculite (its too hard to bury beads in big chunky vermiculite) and find out if your bag has been sieved, to ensure minimal dust. 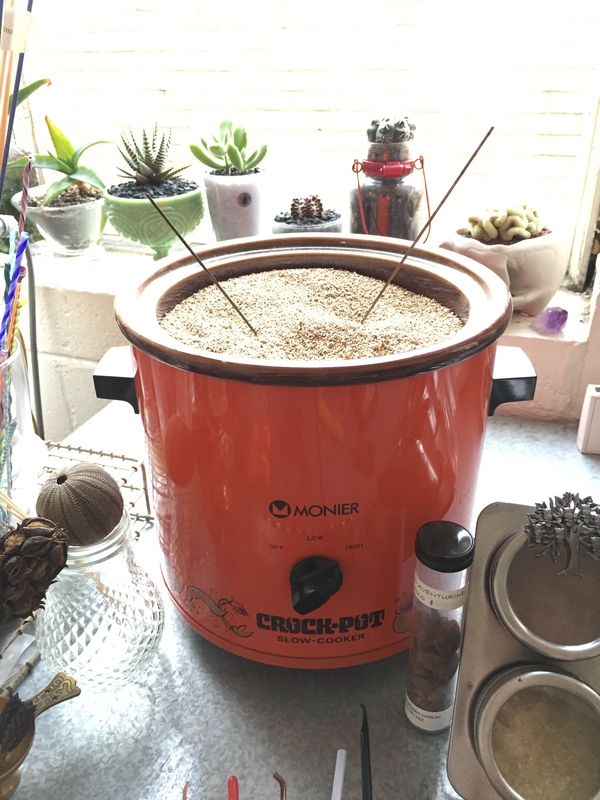 I put the crockpot onto high before I start my torch session (vermiculite absorbs moisture, so heating it up will remove moisture). After the torch session is done from high I’ll turn it to medium for an hour and from medium to the off position. It takes about 4 hours to go cold. 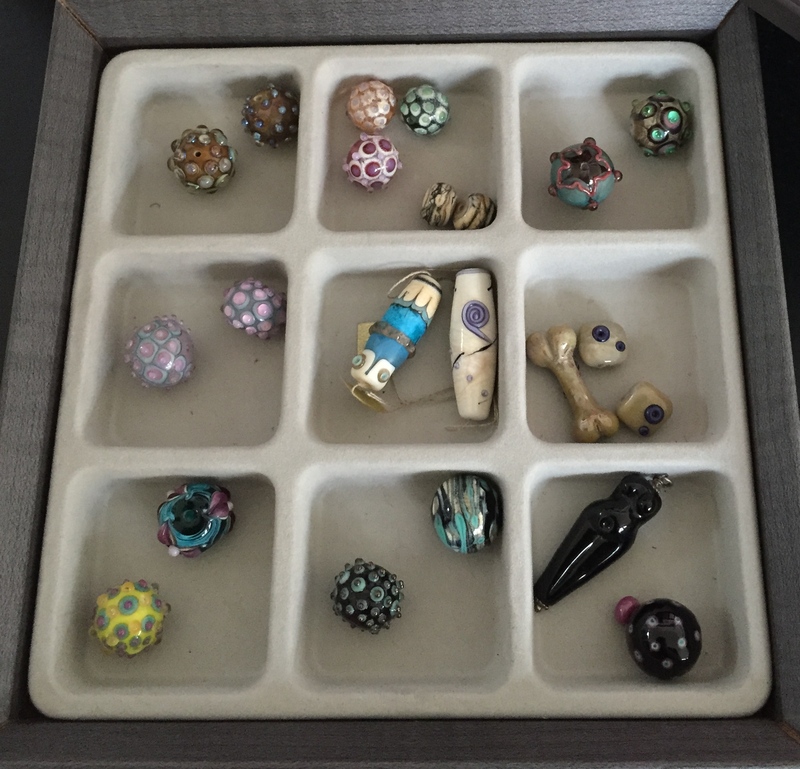 I then store my cooled beads in my kiln, when it’s full I’ll run the annealing schedule. Vermiculite is a natural product and isn’t hazardous to your health if used sensibly, just make sure you get a small size with low dust. DO NOT peek at your beads once they’re in the vermiculite until it is completely cooled down. Peeking at “warm” temperatures to us, will almost certainly put stress into the bead and lead to cracks. (I used to peek, but now I don’t too many beads have cracked on me due to impatience). I usually run my kiln at the end of a week with 30 or 40 beads, this saves on a lot of electricity. Pro. I didn’t buy a fibre blanket, but that is one method of cooling beads down slowly. Kilns usually have fibre blanket or fire brick in them, fibre blanket and vermiculite is inexpensive. Pro. Another method is the crockpot full of vermiculite. 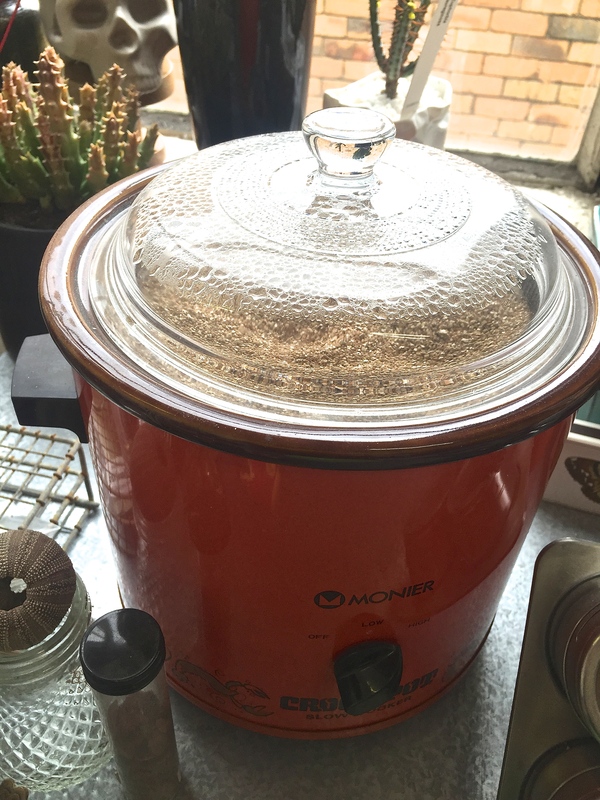 I can set the crockpot to heat the vermiculite, guaranteeing a slow cooldown for my beads. I found a new (old) crockpot in a junk store for about $10.00. Pro. 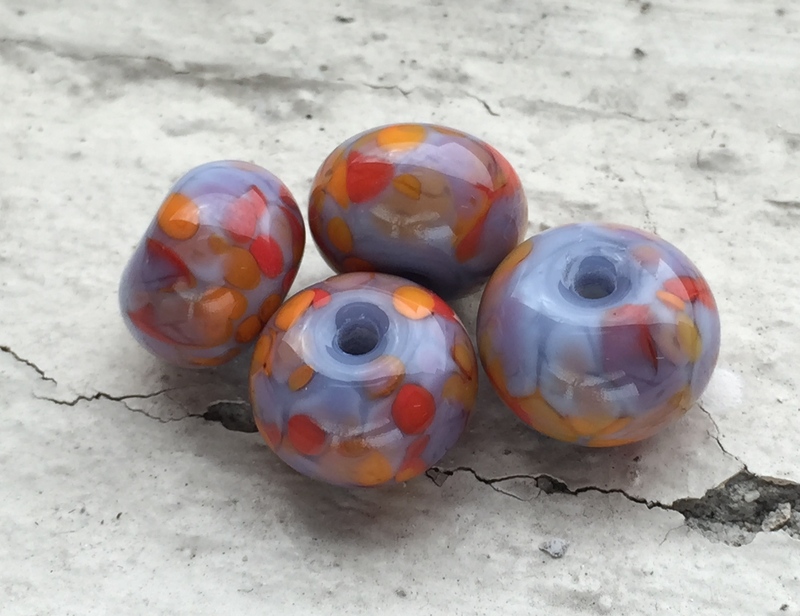 Flame annealing beads and cooling beads down slowly in a crockpot or fibre blanket offers some durability and for round beads, this is actually enough for them to last, well, indefinitely. (Ancient people didn’t use sophisticated kilns and archaeologists are pulling up glass beads all over the place. Food for thought!) Maybe Pro? 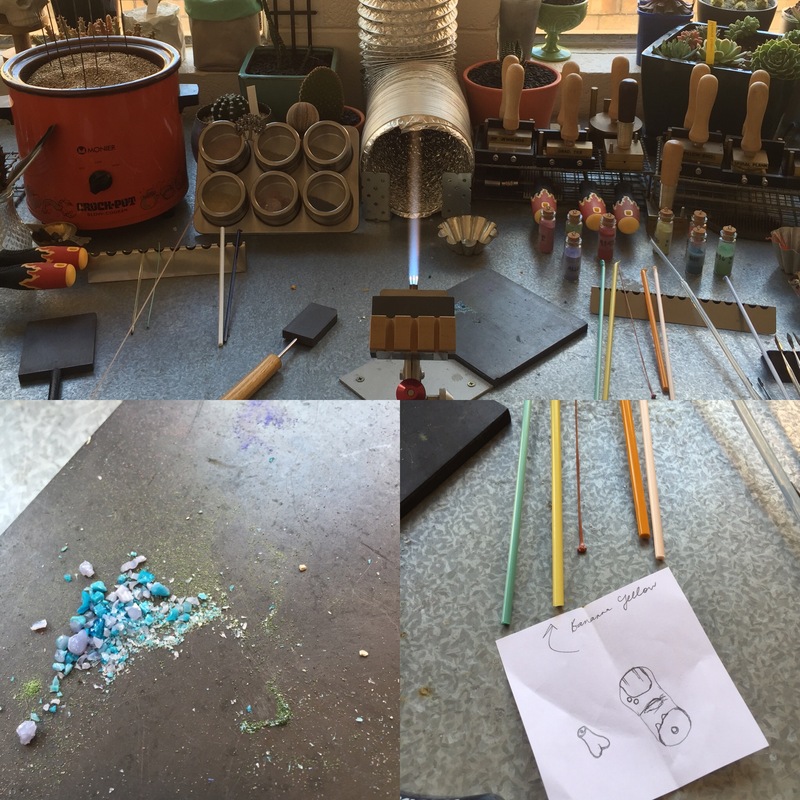 Batch annealing means you have to actually wait until there is enough beads to warrant running the kiln. This also means you have a silly amount of beads to clean at once when it’s done. 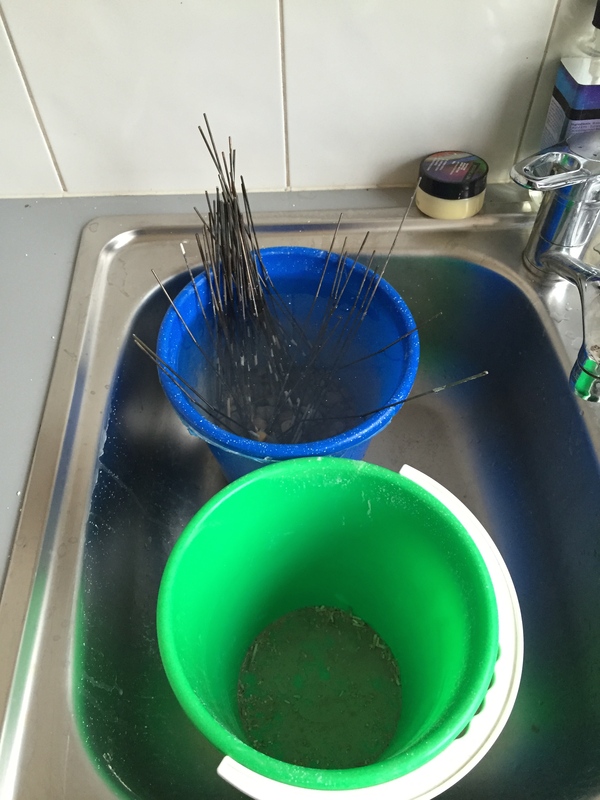 (ugh, I hate bead cleaning). Con. Multi program controllers and kiln annealers are expensive, a good quality second hand one will set you back at the least $800.00 AUD (that is if you’re lucky enough to find one with a controller and a bead door). You’re more likely to be paying upwards of $1800 AUD for a kiln with a multi program controller and bead door. Con. Fibre Blankets and Crockpots rely on the bead having a lot of internal heat. Long or thin beads crack more easily because the heat is not centred in one place, so they must be flame annealed carefully (which can alter the composition of some glass types, that is, you’ll see noticeable colour changes or reactions happening some times). Maybe Con? If you don’t flame anneal properly and then put the bead away in the blanket or vermiculite a cold spot could develop a crack and ruin your bead. Con. You can’t disturb beads once they’ve been put away into a fibre blanket or vermiculite. Jostling them about to fit more in, will more than likely introduce a cold spot. When I’ve made a lot of beads and I’m running out of space in my crockpot, I forget this basic rule and always, I’ll get a bead with a crack (bugger my impatience). Con. 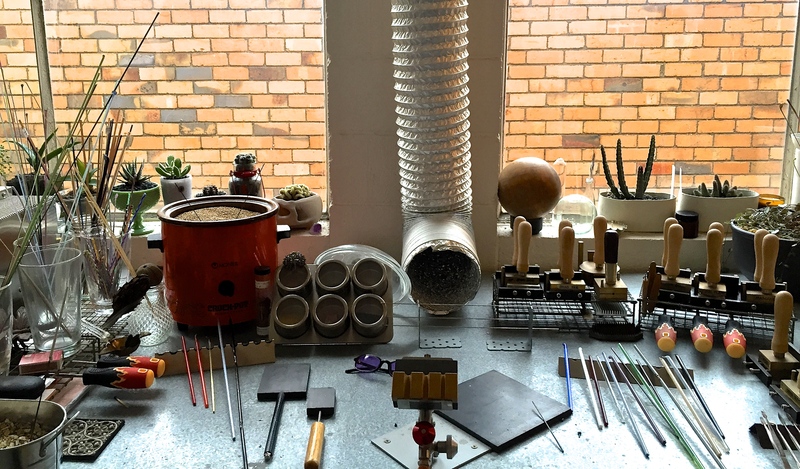 If you read through that list and thought the fuss of batch annealing is not worth saving a few hundred dollars, then I recommend getting a kiln with a bead door. 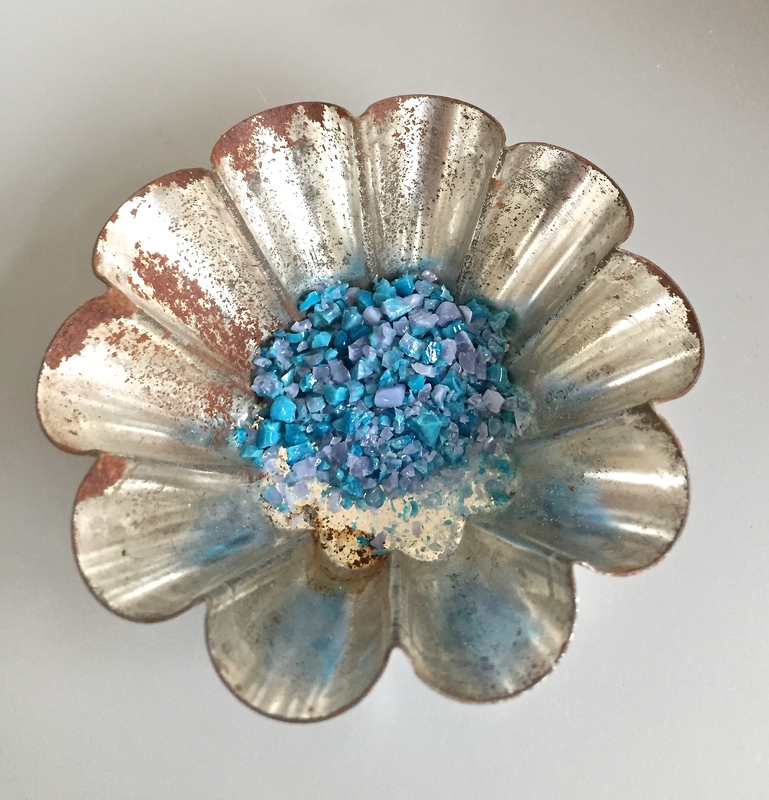 I will always keep my big batch anneal kiln, but I certainly do want a small kiln with a bead door to sit on top of it for the days that I make hugely elaborate beads and want them to survive. Hugely elaborate beads, like large “Goddess” beads don’t have a good life expectancy in a fibre blanket or vermiculite if you don’t flame anneal well. The uneven heat within a bead like that means it is very likely going to develop a stress fracture, you really must be consistent with flame annealing. I use an insulated power board with safety switch for expensive electrical equipment, such as the oxycon and kiln. If you get your kiln from the US, make sure it’s been converted to 240v and the plug changed over. 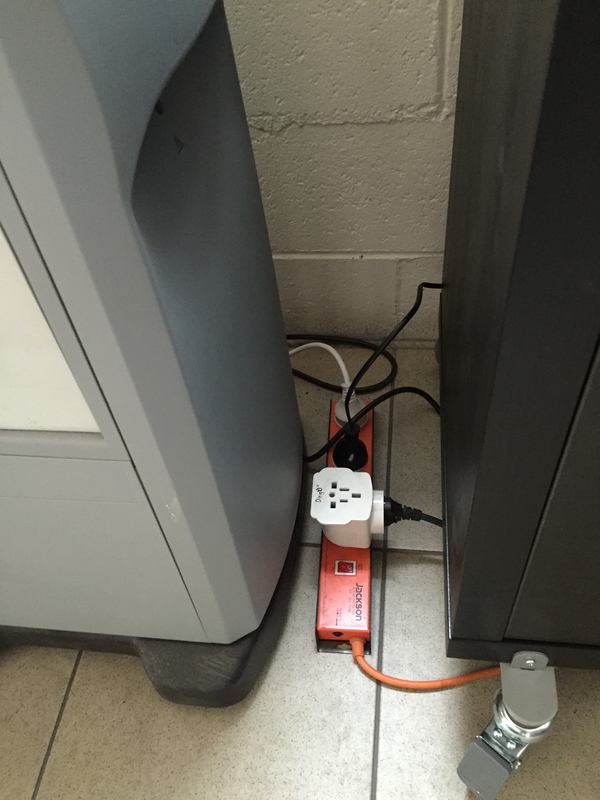 If the plug has a US pin, grab a plug converter. (My oxycon is on 240v, but the plug wasn’t switched over). Kilns are expensive to run, they use up a lot of power. This might be very important to you if you’re an “off grid” person. Most bead makers distinguish between a true kiln (one that can anneal, slump, fuse and tack glass) and annealers (can anneal only, that is; bring glass up to it’s stress point and then cool down) If you have an “annealer” running for a long torch session whilst you “garage” your beads in it, then set it through an annealing session you will see a big spike in your electricity bill. The other rule is, the bigger the kiln the bigger the electricity bill. When I had my studio in my home. Running the kiln a few times each month saw my electricity bill doubled. I was a bit surprised actually at how much power a kiln uses, so I make sure that baby is full before I run it these days. There are some kilns that operate like an annealer (that is, they have a bead door on them and will hold for long periods of time at a predetermined temperature) but can also slump, fuse and do all the other things a bigger kiln does. 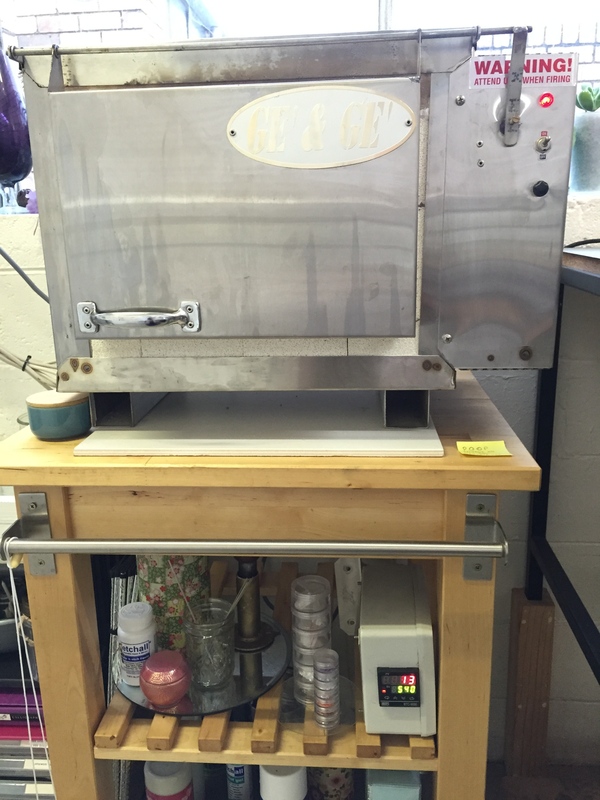 These are the most desirable kilns on the market because of their compact size and versatility. This is an example of Double Helix glass testing. I’ve made notes on how much flame strike happened on these beads and what colours I used. Then I’ve taken a photo with my phone so that I recall what the beads looked like before I put them in the kiln, so that I can see if the glass strikes in the kiln. How to stop glass “kiln striking” in an annealer type kiln. 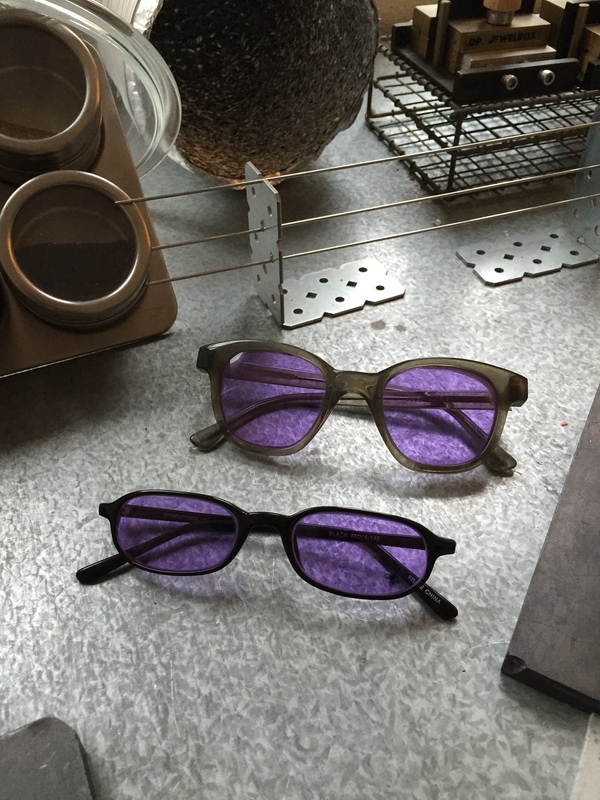 One other difference between batch annealing and flame to kiln annealing is that you can overstrike certain colours (particularly silver glasses) in annealers that are garaging beads for a while. The only way to get around this happening is to make test beads up to check how much flame striking is needed before going into the kiln. 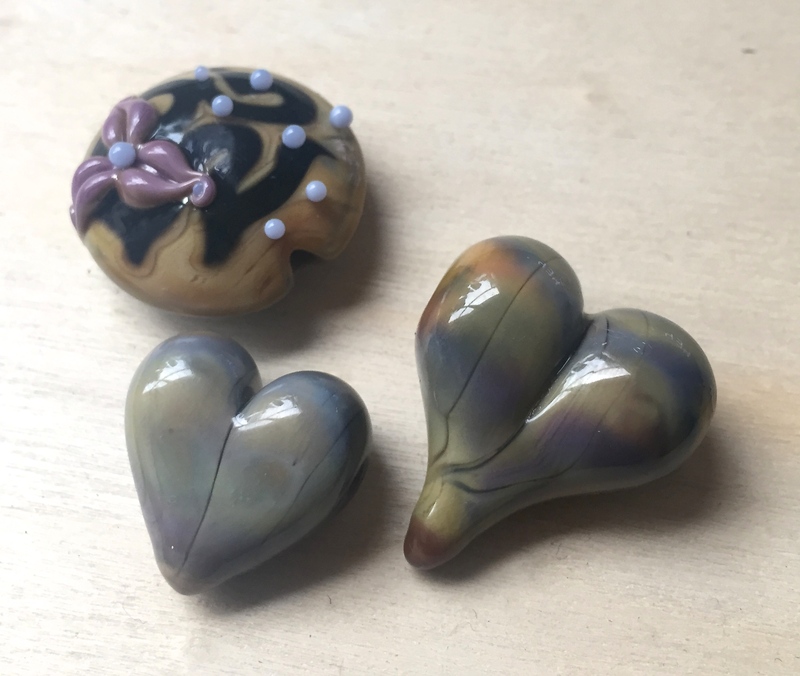 Just make a few small beads in the colour you want to experiment with and try them out at different strike ranges, then pop them all in the kiln. Try to keep track of how much flame strike was on each bead. 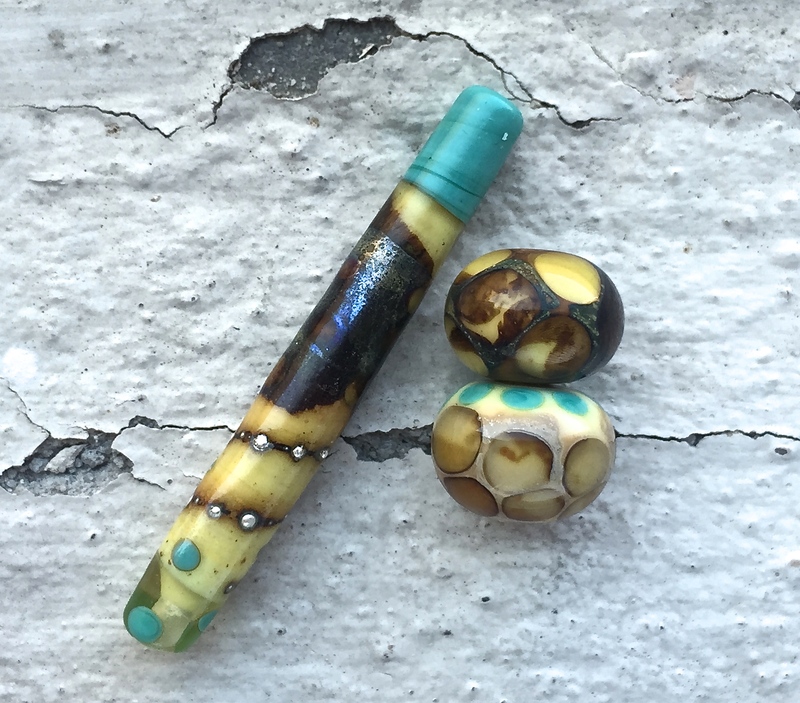 Make a chart or use a permanent marker on the end of the mandrel to colour code the beads to identify how much a bead was struck before being put into the kiln. With this way, you can guarantee the colours you want in your silver glass beads. Silver glass manufacturers Double Helix, Striking Colour (Unfortunately the owner and manufacturer of Striking Colour was in a terrible motorcycle accident and has not been able to produce glass for some time) and R4 or Precision104 as it’s now known suggest doing this exact technique on their respective websites and they also offer tips and advice on different annealing cycles to try for certain glasses. (Devardi annealers only anneal beads. Several people have them and the warning is to get it’s heat range tested by an electrician. Mark the dial with the anneal point so that you do not accidentally melt all your beads flat). …and if you just need a controller, in Australia you can purchase a controller to suit pottery kilns here or here. Controllers made in Australia are usually manufactured by Harco. Lastly, think about what you make. If you’re mostly a bead maker getting a kiln with a bead door is probably the best option and its better to save up for it. If you want to slump and fuse, find a kiln that can do that and maybe forgo the bead door. If you’ve been given an old ceramic kiln, it’s salvageable by getting a controller fitted to it. If you bought a kiln years and years ago and are thinking of an upgrade, then I hope you found what you needed here. Tools lined up on my bench within easy reach. The racks are old wire test tube holders from my uni days. 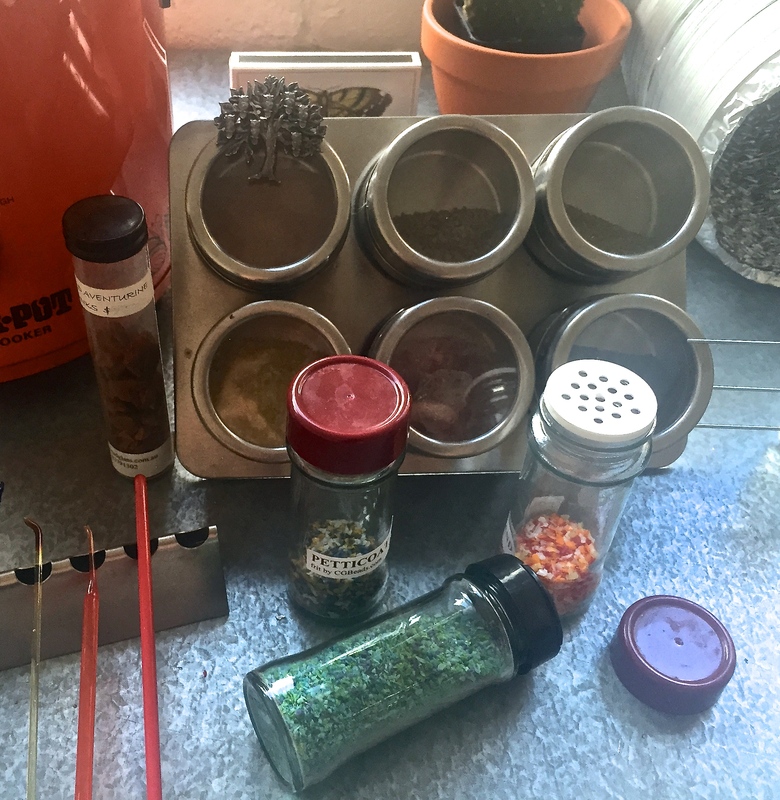 The magnetic spice rack holds reduction frit and “raku” frit. Behold my awesome view. Studio Set Up Part 7 is a general discussion about advanced tools. 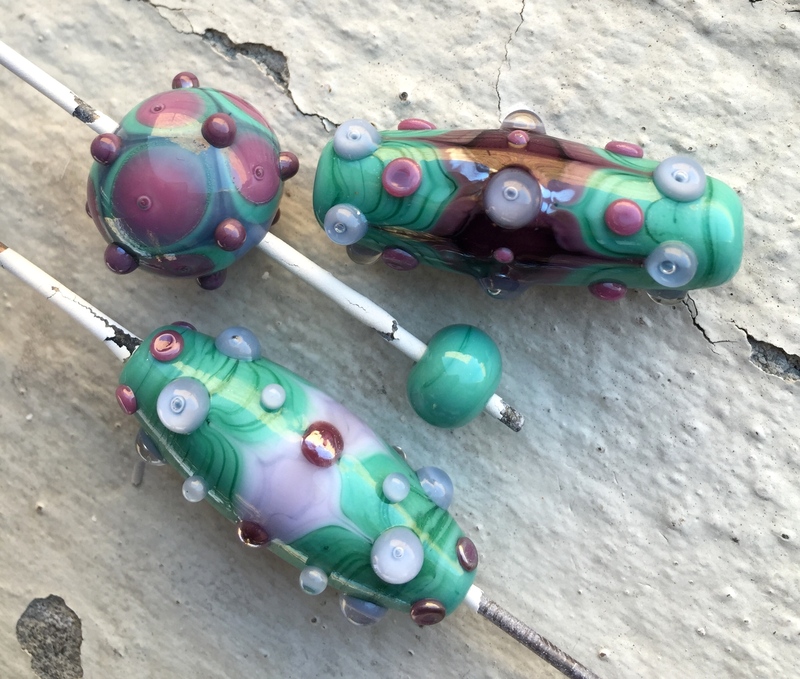 I move beyond the first 60 hours of lampworking and explore the various types of tools on the market that help an artist refine or expand their style. 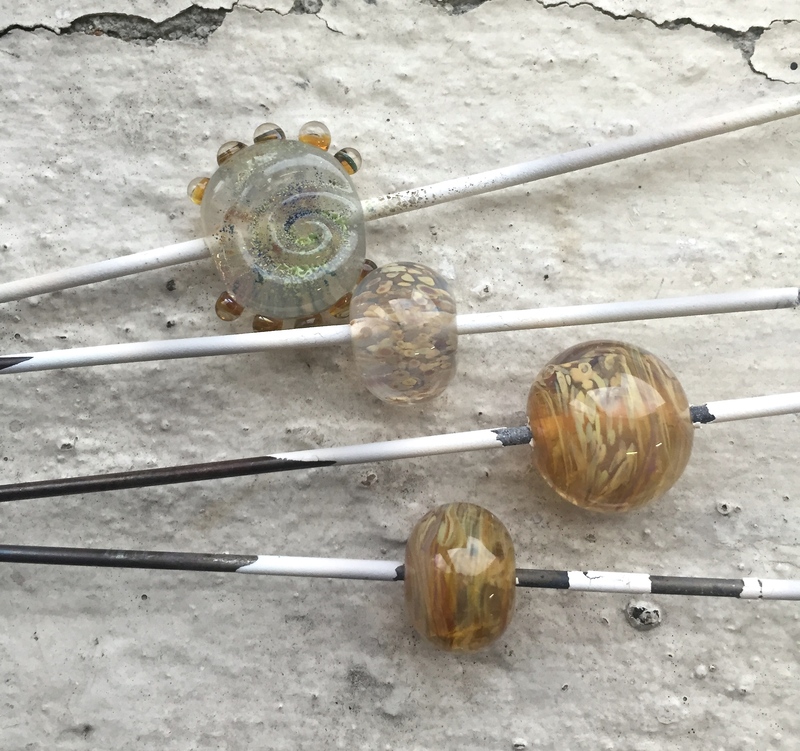 I explored essential tools for the new lampworker in Part 6, along with my experiences of learning how to shape glass with gravity, heat and a marver. 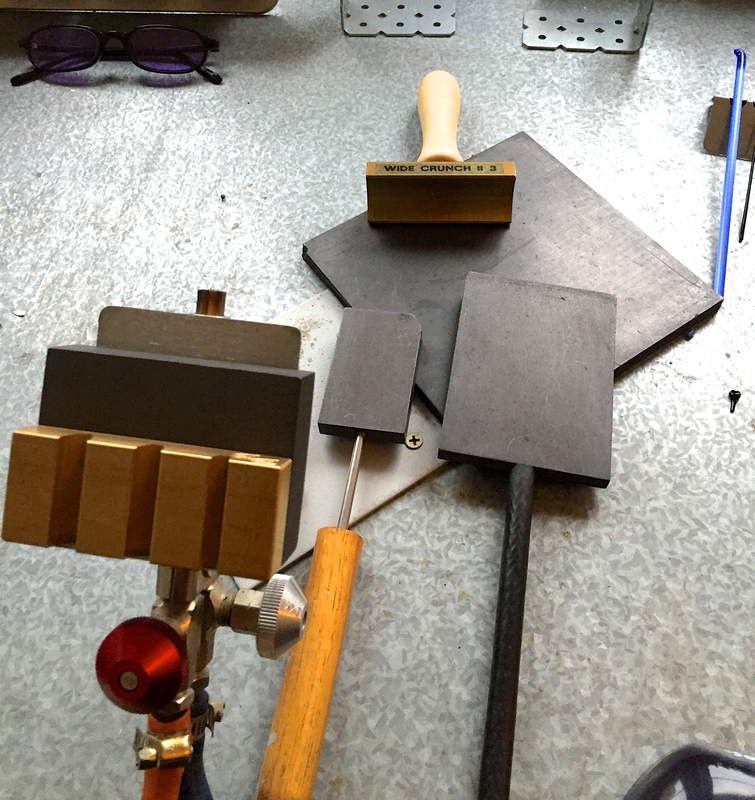 In this blog post I share my understanding of how certain tools are used and talk about the most popular types of tools, which are brass presses, tong presses, special mandrels and graphite shapers. 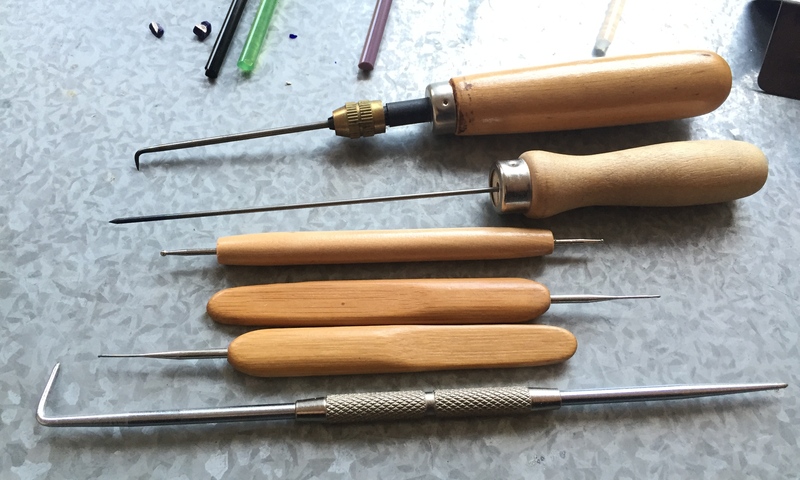 These tools are popular because they’re affordable and provide options to lampworkers who sell their beads regularly. In exploring beyond basic tools, I hope to share an understanding for what you are buying, the reasons behind purchasing a tool and how tools can benefit you as an artist. This is a very long blog post, so I have decided not to include kilns, instead Kilns will be discussed Part 8. I have subtitled everything in this post to make it easier to skip to the parts useful to you. I’ve also been very sick with Bronchitis for the past few weeks, so the photos for this post will be updated at a later time. For the bead maker who doesn’t like spending long periods of time shaping glass and wants to focus on decoration. Brass presses and graphite shapers are necessary. 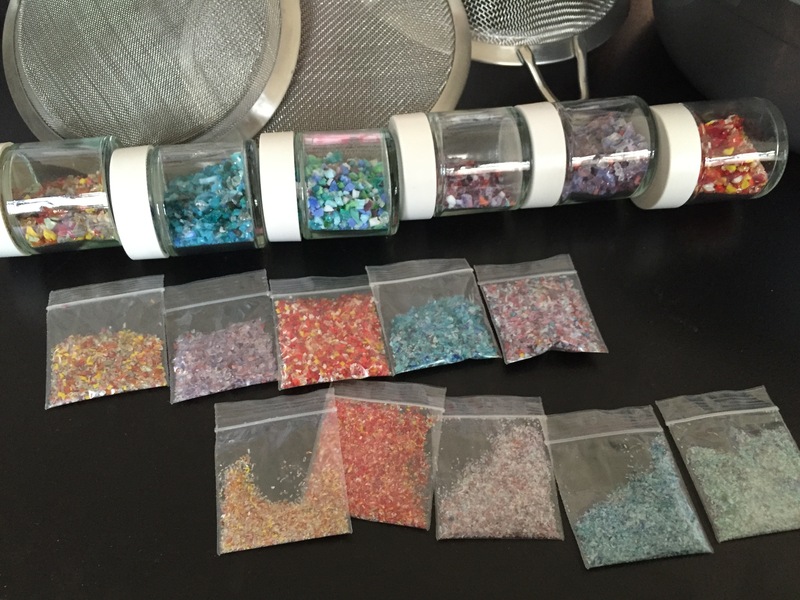 For the bead maker who loves to make sets of beads but doesn’t want to fiddle around calculating the exact amount of glass needed for each bead to perfectly match and just wants to get on with the job of decorating. You will want tools. Lots of them. I’m not enabling your addiction, I’m merely reinforcing what every lampworker already knows. You can never have too many tools. These beads are all made even and round using a graphite shaper. 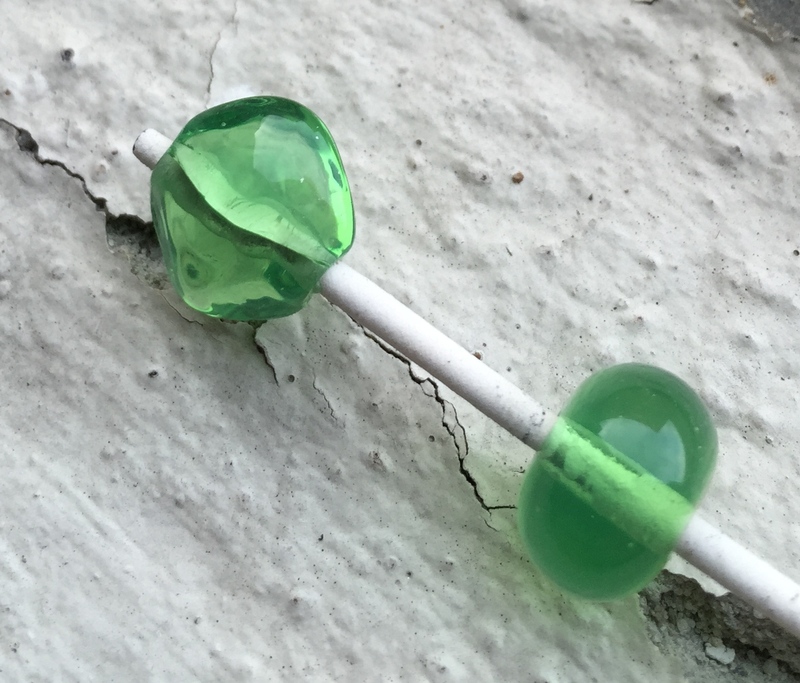 Less time making the base bead means more time decorating and if you’re not thrilled about the shaping of glass and more interested in the decorative part of making a bead, you will love your tools. I don’t own all the tools that I have on my wish list, I would be very poor if I did. That means this isn’t a comprehensive guide to every tool on the market. I will explore and explain a bit about the tools that I have which can be grouped into four categories; brass presses, graphite shapers, specialised mandrels and tong presses. When I began buying tools I wasn’t thinking long term, my exact thoughts were “ooh pretty, I want that one”. I was not looking at bead making tools as a business investment, I was looking at them as a possession to own. For anyone living in the Southern Hemisphere (Australia and New Zealand, I’m speaking to you), any sort of tool that is not manufactured locally (just about all of them) should be treated as a business investment. 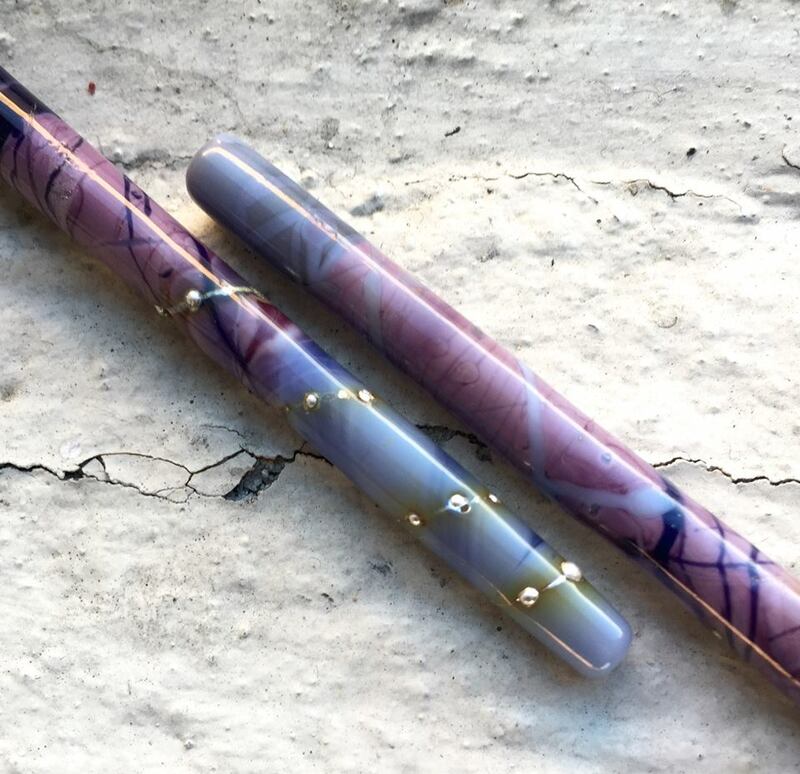 The cost of buying the tool in a foreign currency and then the prohibitive shipping means that lampworkers in the Southern Hemisphere pay double per tool. I bought 3 tools from Devardi two weeks ago, in US dollars the invoice for the tools was $48.93USD. If I lived in the USA the price of postage would be gratis, but I don’t. The postage charge to Australia was $28.00USD (39.90AUD), with the conversion rate my order worked out to be $109.90AUD. I was refunded $5.70AUD in overpaid postage and Devardi do not have a S&H fee. Which means that 3 tools cost someone living in the United States $48.93USD, cost me $104.20AUD. Gee, I better hope that I use those tools since they are such a big investment. Another thought strikes me, these tools need to pay for themselves. When I buy a tool I ponder on its usefulness. Is it a shape my customers would like? Will they buy beads made with this tool? Will this tool be worth the money invested in it? I bet you thought I was kidding about tools costing twice as much for people in the Southern Hemisphere? You should always pick tools that appeal to your sense of style. Don’t buy a tool because some other artist uses it and you’ve noticed they get a lot of sales. Buy a tool that will expand your design possibilities, excite and inspire you to create more or lead your aspirations to achieve the most out of your bead making style. If you do that, you will naturally produce beads in shapes and designs that will appeal to a wide base of customers. If you’re only making beads for yourself, then you will be impressed with how much you can grow your creativity when challenged. When you’ve decided on the tool to buy, you should think about what you want out of this tool and really, this goes back to the central reasons for why you bought a torch in the first place. Are you going to be selling these beads or is this a hobby that you’re going to indulge yourself in? If it’s the latter, just buy what whim takes you (oh, I wish I could). If it’s the former and you intend to sell beads as a business, I use this formula to work out the cost effectiveness of purchasing that new tool. What is the grand total cost of this tool? How many beads do I expect to make with this tool once I have mastered it, per year? How much would I charge for those beads? Then I do some simple mathematics, for a cost benefit analysis understanding of what I need this tool to do to make it worthwhile me purchasing it. This isn’t really scientific or completely accurate, I don’t factor glass or time into the cost. All I’m trying to do is judge the rough length of time this tool will take before it pays for itself. From there I can work out if it’s a “need” tool or a “want” tool. Do I need it because fashion styles are changing? Do I need it because I have been struck with an amazing idea that I want to see translated into a shape I can’t make with gravity and my current tools? Do I want it because I’m bored and it will inspire me? All of these are good reasons for buying a tool. 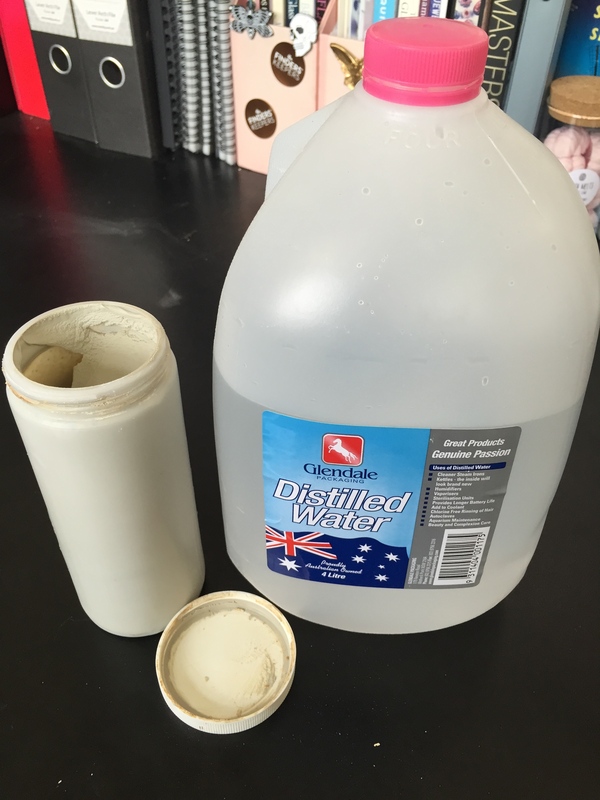 (tool = $27.07AUD) + (postage = $11.40) – I divided the total postage by 3 because I bought 3 items. This tool is a lot trickier than I expected and there’s a bit of a learning curve. I expect that I will make about 40 beads a year with this tool, but will probably only sell about 20 in that time frame. $12.50AUD x 20 = $250AUD per annum. Even without factoring the glass and time in, if I sell 20 mid size beads a year made with this tool, it’s a pretty good investment. If I do end up purchasing the tool (which I did in the case of the Devardi tools) I keep this little cost benefit analysis on the back of the original invoice. At the end of the financial year I’ll look back on my taxable items (I’m a registered business) and see if the tool actually did pay for itself, if it was a good investment after all. If it wasn’t a good investment, but I still really like the tool I will recalculate (say I only sold 10 beads that year, and I have 30 lying around.) I’ll put the new formula down and review it next financial year. After 2 years if the tool still hasn’t paid for itself. I’ll make a decision on if I keep it or sell it to recoup some costs to buy a new tool. If I haven’t used it much and it’s just sitting around, it should go. So far, I haven’t sold any of my tools. I have a bunch of them earmarked for sale, but when I look at the original cost prices, sometimes, it’s just not worth reselling them! I use the term “Brass Press” to denote a stamping type press with a handle. The press body is made entirely of brass and the handle is usually made from wood. The press may align itself with pins (Perlenpresse, Bavarian Beads and Zoozii’s) or be aligned due to a base (CattWalk). Why then, would I buy primarily CattWalk presses if I have to pay for the extra expense in both shipping and cost of a base? Actually, CattWalk never charges for shipping. So that was something I factored in when making my choices. But really, when it comes down to it; I find a press with a base a lot easier to use. Most of my presses are from CattWalk. You can see that they are sitting in a brown metal base. The tool with the brown handle and the tool directly in front are pin presses. You can see that CattWalk presses use a different technique to line up the top and bottom. I prefer this press style. No one now really speaks about the differences between pin presses and base presses. I think it was a hot topic several years back, but there are so many toolmakers around making pin style presses these days, the issue seems to have evaporated. Presses with pins will have two brass rods attached to the base of the tool, and two holes drilled into the top of the tool to line the press up. Presses with a base have the bottom part of the tool clamped into the base, and the top part is lined up with a guide pin on the base. The argument for pin style presses is that they line up better, and I think they do, there is certainly less room for error with the guide pins. However, I used to have real trouble dropping the press down onto pins and lining the top and bottom up properly. Which is why I still have so few pin style presses. I wear prescription glasses and one of the things I’ve never done is wear my prescription glasses for lampworking. I find clip on didy’s very annoying; so, I do my lampworking not wearing my prescription lenses. (Talk about making it hard on myself). I cracked so many Kalera beads because I was not quick enough to line up the pins. Brass presses really chill your bead, so you need to reheat it properly and press fairly quickly otherwise it will get too cold and crack. The obvious solution is to wear glasses, but it was more than just having a bit of blurry vision for not using pin presses much. It was the handling of them. It actually took me a long time to get the knack for using a pin press, but once I got the hang of it, I went out and bought a few more. As you can see graphite marvers come in all shapes. The CattWalk #3 Wide Crunch press can be used like a forming tray to shape beads. The brass disc forming tray sitting on top of my torch marver is another such style of brass tool. You should be able to use the top part (with the handle) of any brass press for shaping. For instance, the top of a CattWalk #3 Wide Crunch press becomes the perfect thing to shape plump olive beads. I can use the top part of my Zoozii’s Kalera Long & Lean press to shape square beads, but, a press without pins, has another bonus. The bottom part of some CattWalk presses can be flipped over for a different press option. So you’re getting more flexibility out of this style of press. However, pin presses are by and far more popular and they come in a ridiculously enormous range of styles. Ridiculously.Enormous. I have 10 presses from the European manufacturers on my wish lists and because they have so many cool new styles, I keep adding to this list. Brass stamp presses are fairly versatile, there are presses available that don’t require a set amount of glass to make a shape. I tend to buy presses that allow for flexibility. Either I choose a press with a few different sizes in it, or I choose a press that has many design options. For instance the Kalera press doesn’t have to just make long beads, it can make little stubby pillow shaped beads too. Although you can buy presses that are limited in their structure but offer something to a bead maker that they can’t easily achieve with a marver, such as faceted edges, amorphous shapes, thin and flat rectangles and embossed patterns. “Jewelbox” brass press by Cattwalk. I love this press but it has a steep learning curve to achieve that beautiful faceted look. I haven’t used it in quite some time and I forgot that the best look is to use a transparent glass to show off the facets. These beads have more rounded edges because I decorated the surface with raised dots, losing the defined edge I got from the initial press. 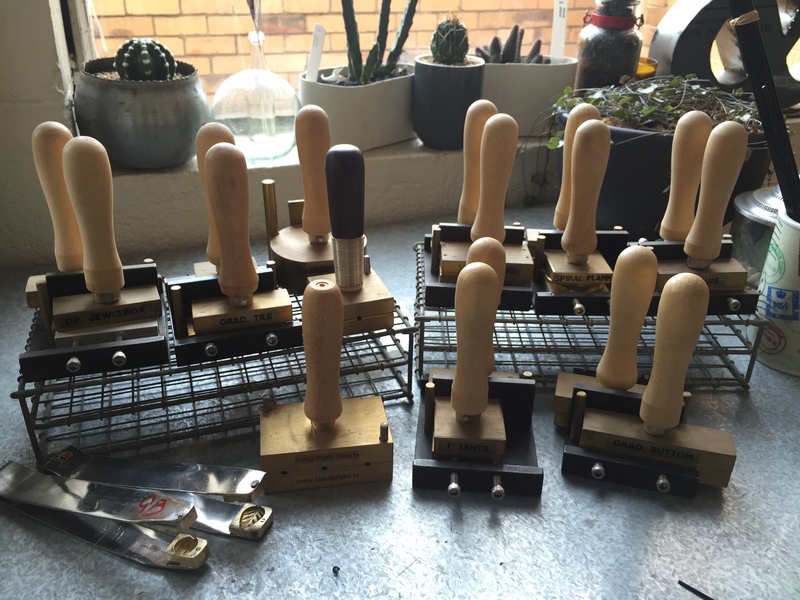 Brass stamp presses require practice to use properly. They also require refinement of skill, you will find some presses easier to use than others. You will also need to learn how to fill the cavity properly so that your pressed bead looks as intended. The good news is that most brass stamp press manufacturers have instructions on their website to use their products and most presses are really easy to use. Some press styles take a little while to master properly, particularly the type that have bits that stick out such as the Butterfly presses by Perlenpresse. These presses can be very frustrating to use, unless you have really good heat control I wouldn’t attempt a complex press. Other press styles look easy, but require some fiddling to get right, such as the very popular Cleopatra shape from Bavarian Beads. You should consider that no matter what press type you pick, there is a bit of a learning curve to them all. 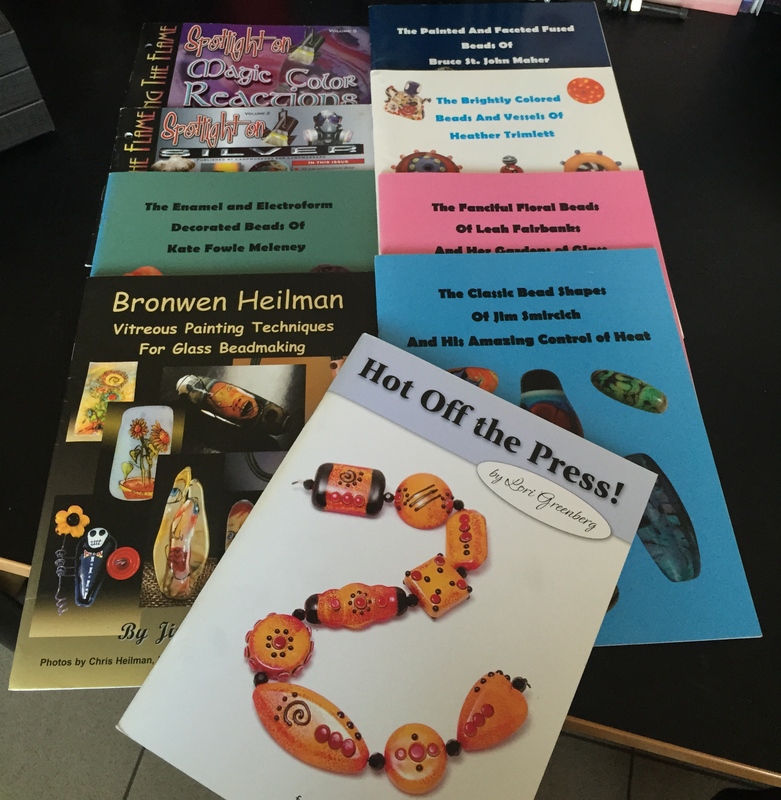 The book “Hot off the press” by Lori Greenberg is fantastic if you’re struggling to use presses. Why do my beads crack after I use a brass press? 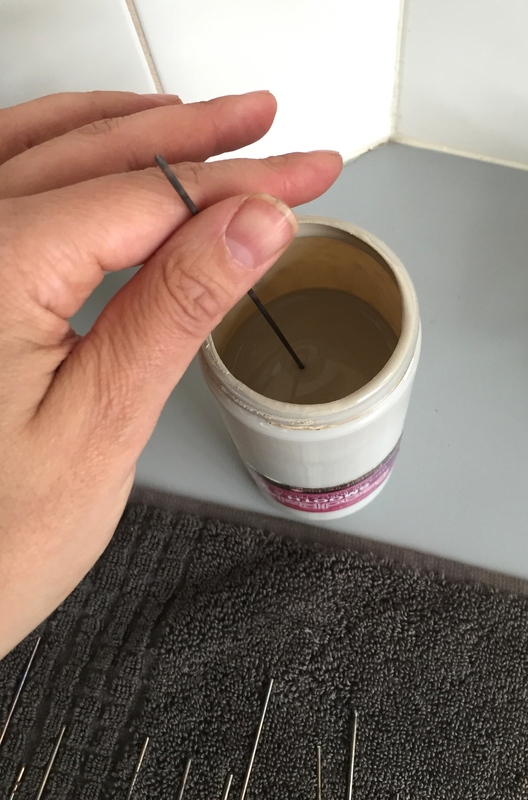 Because brass presses really chill the bead after being pressed it is essential that you develop the habit of bathing your bead in heat immediately after pressing and as you’re decorating. Once the bead has been pressed, up your propane just a tiny bit to make a slightly hotter flame and roll your bead at the very tip of your flame for thirty seconds or more to avoid potential cracking. The larger the pressed bead the longer you will have to soak heat, for instance the Cattwalk Focal Marquis press requires a good minute of gentle reheating once it has been pressed into shape. If you have pressed a thin flat bead and you intend to decorate the sides, ensure that you stop decorating periodically and bathe heat through your bead as you work. 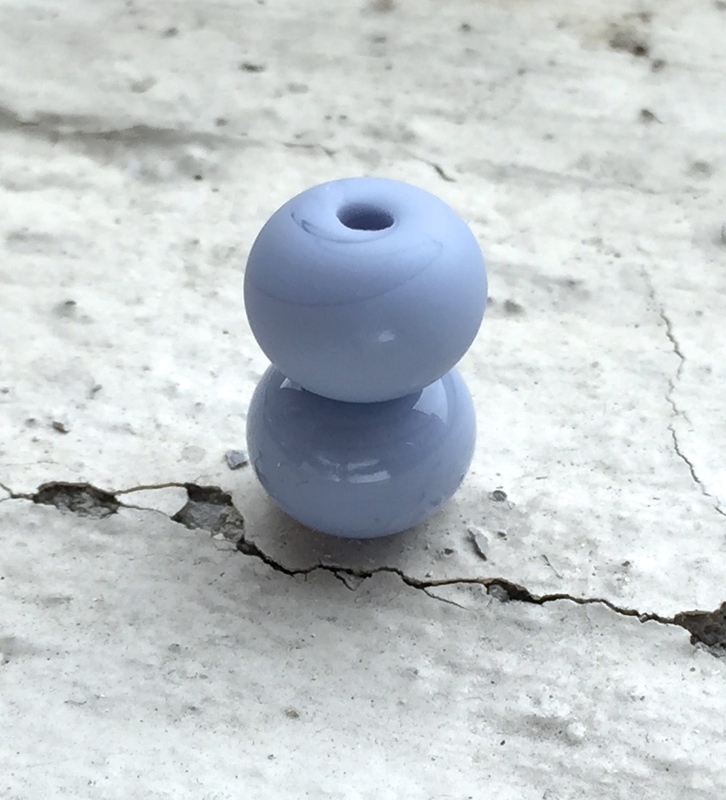 Beads that crack a lot after being pressed is entirely due to being too cold. Some torches have much more ambient heat than others and so you don’t have to heat soak as much, however if you’re on a Minor Burner or a Hot Head you must heat soak regularly. This adds a lot of time to actually making a bead, but it’s worth it because they won’t crack. The power of a brass press is that you can produce exactly the same shape bead again and again. Jewellery designers love “sets” of beads. 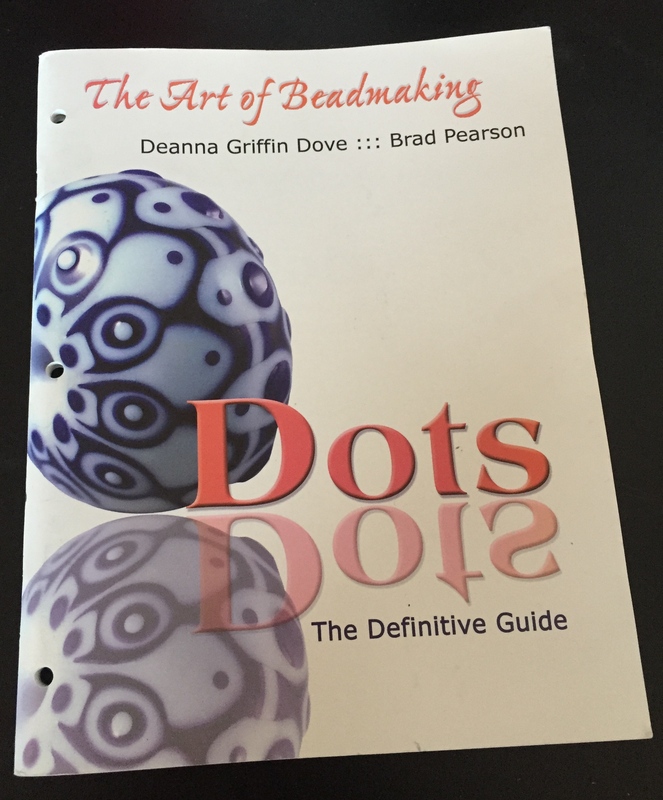 If you’re making beads for a living, you can actually cost out your precise materials for each pressed bead based on glass volume, rod cost and time taken. This might be very important to you if you need to turn a profit or work out your hourly rate for commissions. In 2016 I procured a gorgeous “puffy” heart press and a pentacle stamp from Ray Skene who makes high quality brass stamping tools. Ray has extended his services to make custom presses, as far as I’m aware he is the only tool maker doing this for artists directly. That means, if you have a shape you have dreamed up Ray is the man to make it happen. His business “Lampwork Tools” is located in the United Kingdom. Visit his page, you won’t be disappointed. I didn’t buy a graphite shaper until two years ago. 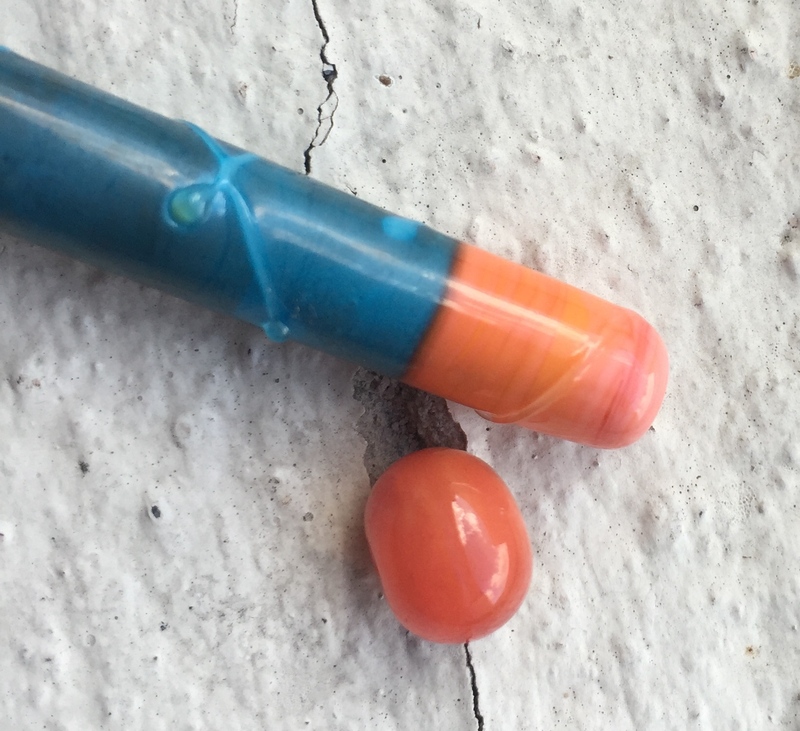 Although I don’t use them much, when I’m having a bad day and nothing is going right, it is so nice to reach over, grab one and get that bead shaped without hassle. Overwhelmingly my shapers are from CGBeads, I purchased one recently from Devardi because I wanted to see what the difference was. 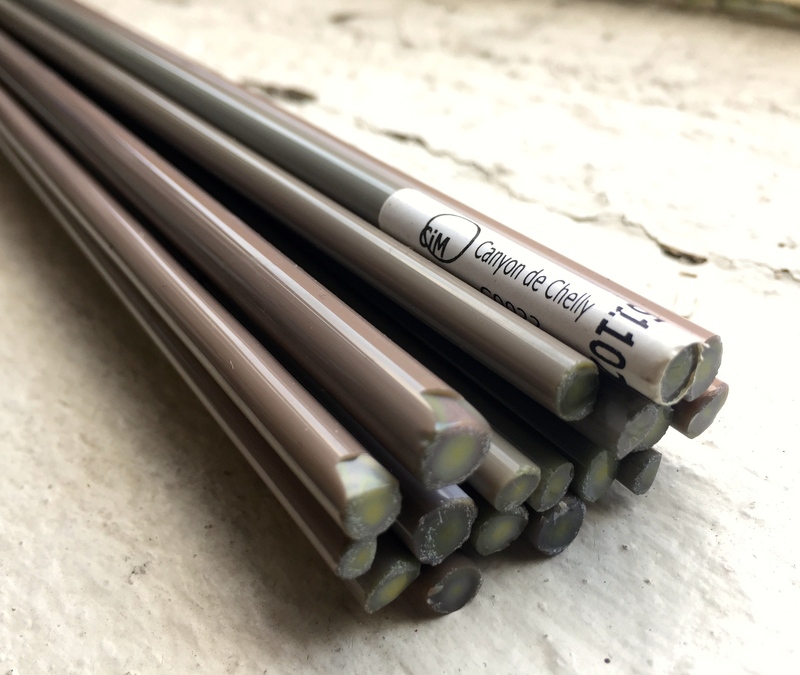 Graphite shapers such as those from CGBeads have a defined bead shape, unlike presses which squash the shape into a bead, shapers rely on spinning hot molten glass in a cavity or across a grooved surface to acquire the shape. They take a certain amount of glass to shape the bead, too little and it won’t have a nice smooth shape. Too much, and the bead will develop wrinkles. My collection of CGBeads Shapers and my lone Devardi graphite forming tray. I started out with the mixed cavity shapers because I wanted to see if I actually liked this style of tool. When I’m having an “off” day, these tools are lifesaving. I find CGBeads shapers very easy to use because of their cavity style. They have a beautiful smooth quality finish. The trick is to shape the basic bead, add the right amount of glass, heat until just soft and spin the bead into the cavity to get a perfect shaped bead. Its a very small learning curve. If you already know how to make beads, a CGBead “roller” just cuts down the time to make them. I’m not fond of the blocky handles, I find them a bit cumbersome, but I’m not fond of the handle on Devardi shapers either. I think I’m very used to the slim handle on my paddle marver. The Devardi tools, most of which are forming or profile marvers (you roll the bead along the length of the forming tray or grooved profile) have a definite learning curve to get the nice sharp definition that you can get very easily from CGBeads cavity bead rollers. I really love the shape of the Devardi tool I have and they seem pretty good. I think overall, I prefer the way CGBeads design their tools because I find the cavity much easier and quicker to get the shape right. Then there is the price difference, Devardi shapers are a fraction of the cost of CGBead shapers. My guess is the price difference is due to the type of graphite used and the difference in finishing the graphite, perhaps the labour costs in creating the tools as well. Either way, if you’re in the US a Devardi tool is very inexpensive and a good entry point into this style of tool. This is the melon bead press by Devardi. Absolutely a pain in the bum to get a bead to press perfect in it as one side of the press is more defined than the other. I hate lopsided looking beads. I end up flipping the bead over and pressing twice into the bottom cavity which is more defined to get a uniform look. (But I love the shape) I might machine out the top cavity one day to match the bottom. The most famous of all tong presses have to be the ones produced by Carlo Dona. They are a huge investment, so I have never purchased one. However they make the most exquisite bell shaped flower presses. Interestingly Devardi also make bell shaped flower presses. Since I don’t have a bell press from Devardi either, I can’t do a comparison on which one is better. Although at the price Devardi charges for their tools, it’s a low cost risk to see what they’re like. Based on the two tong presses I already have from Devardi I will say that they make pretty nice beads, but for really tiny mandrels. The tongs line up well and whilst there is a seam mark visible in one of the beads pressed from a tong its easily smoothed out. 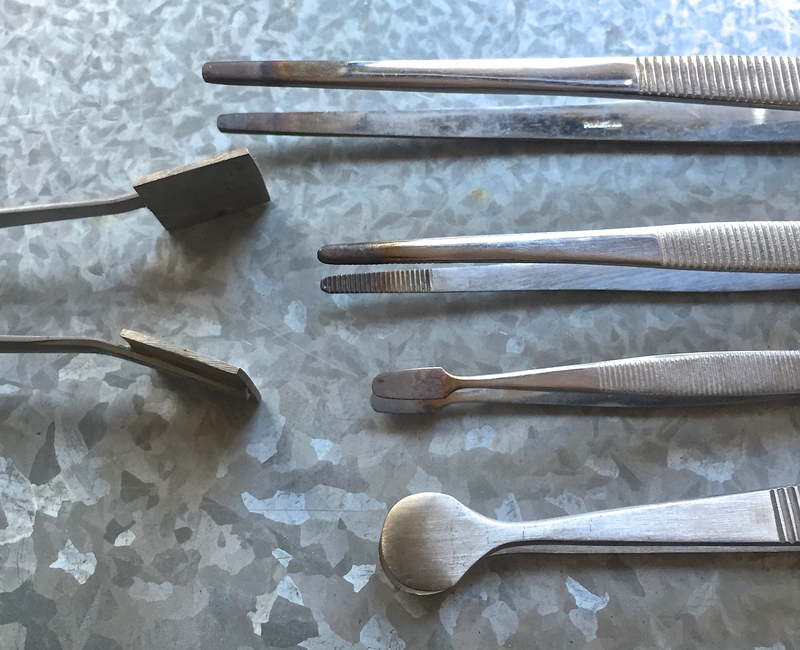 A good mid range priced tool are the Jim Moore tong presses he has a small but very select range of tongs for lentils and cushion shaped beads, along with some embossing tongs which are exquisite. I keep thinking that I should buy one, but the logical business side of me cannot justify the cost. I need to sell more beads. 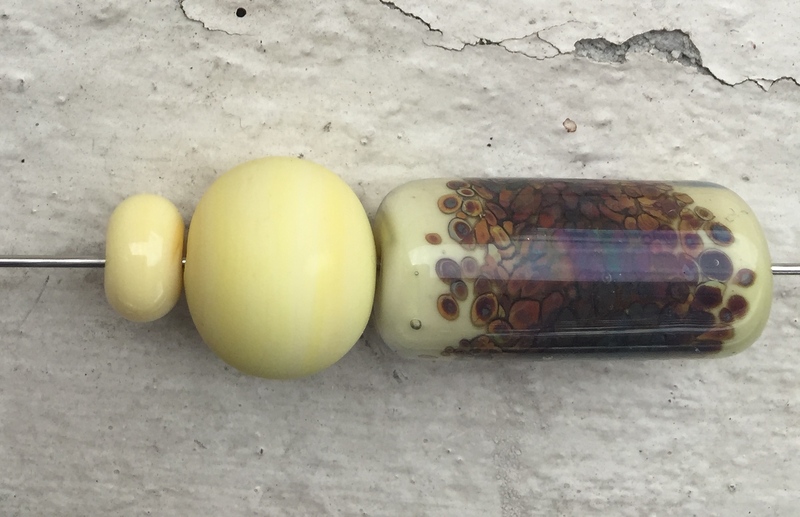 These beads were all made on the same mandrel, with the cracked bead made last. Brass presses chill your bead very quickly. If you don’t reheat your glass gently at the top of your flame to soak heat through (without losing the pressed shape) your bead will crack down the middle. 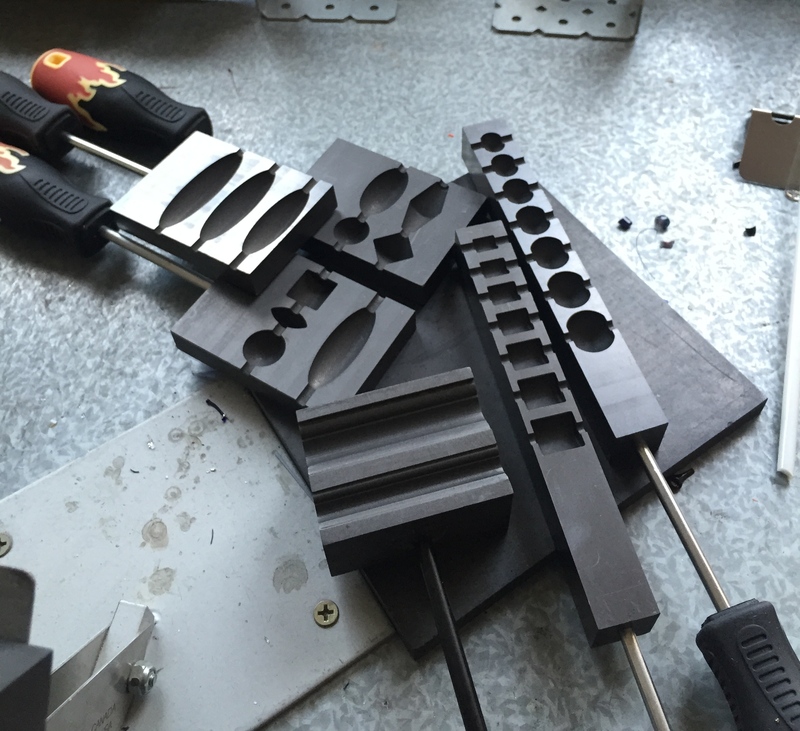 The interesting thing to note is that tong tools work in much the same way as brass presses. 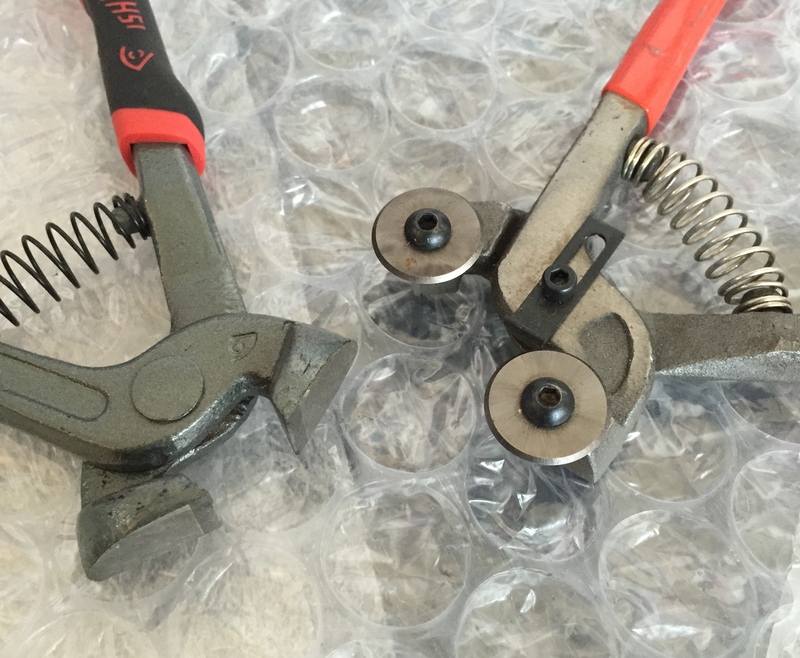 You need to know how to gravity shape a bead in order to fit it into the tong and press it correctly. So in that sense, I think tong presses have a higher learning curve than brass pressses, because a brass press is more forgiving. If you have too much glass in your bead, your brass press probably has another cavity and you can add glass to make a bigger bead, but your tong press only has the one size. 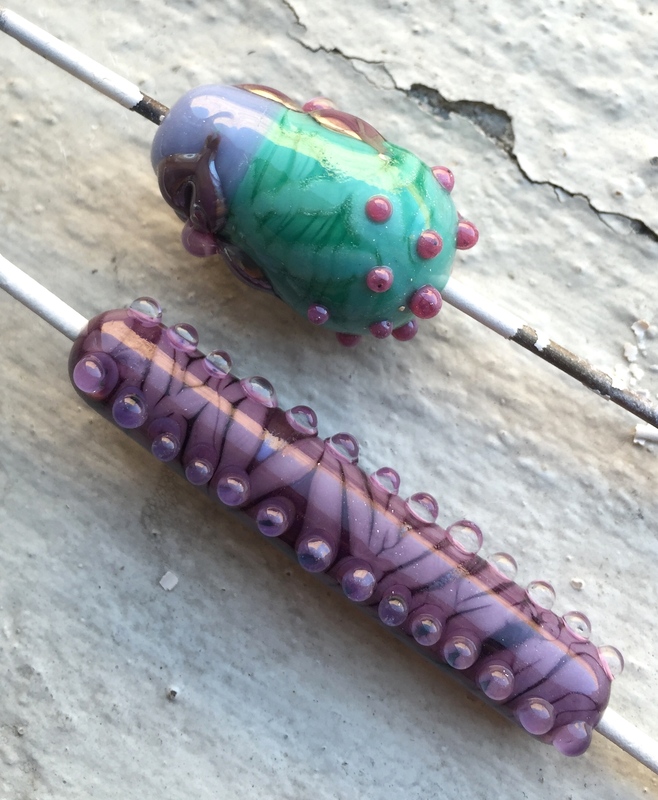 You can pull glass off a bead carefully to reduce the size, but it takes practice at spot heating on a chilled bead, so that you don’t pull the entire bead off the mandrel. Tongs travel well because they are lightweight and make an excellent choice for artists who teach and do demonstrations. Unlike a brass stamp press which needs to sit flat on a table you can lift the tong up to demonstrate bead shaping to an audience. I remember a debate on Lampwork Etc Forum about what was the “best” lentil shape and overwhelmingly the Jim Moore Lentil tongs were the favourite for the overall shape. The top bead was made using two marvers to turn it into a flat tab like bead. I then stamped it with the Jim Moore Spiral Texture Pad and added enamels to highlight the design. There are a lot of tools on the market. Let me rephrase that, you won’t ever own or use all the tools on the market. You will wish you did at times when you see someone use a tool in an unexpected way and fall in love with that design. I wish I owned some texture pads, such as the ones that Karen Leonardo (she calls her tools “imprint” tools) or Jim Moore sell. These are small brass stamps with wooden handles that can be used to stamp a design into glass. I could really see these sorts of texture stamps fitting in well with my organic designs and that is what a lot of artists use them for. EDIT: I actually bought a Jim Moore spiral texture stamp and I love it. It offers a very different look to the Spiral Plank that Cattwalk make (which I have) and it is as easy as stamping it into your bead whilst the glass is hot, but not too molten to distort the shape. The Leonardo texture stamps have a much wider range with some very cool patterns, I have a few stamps on my “wishlist” from this supplier as well. I still wish that I had a good quality pair of parallel mashers for the rare occasions I think a bead would look better squashed, graphite marver pressing can be wonky if you use uneven pressure and once it’s flat, it ain’t going back. Do your research, look at all the tool makers and see if you can borrow some to use. If you are in an area where you can borrow tools from a studio tool library, go and do that to see if you love the tool enough to buy it. If you don’t and you’re not sure between one brand or another, go with your gut instinct. You’re an artist after all. An assortment of big hole mandrels in different shapes and styles. 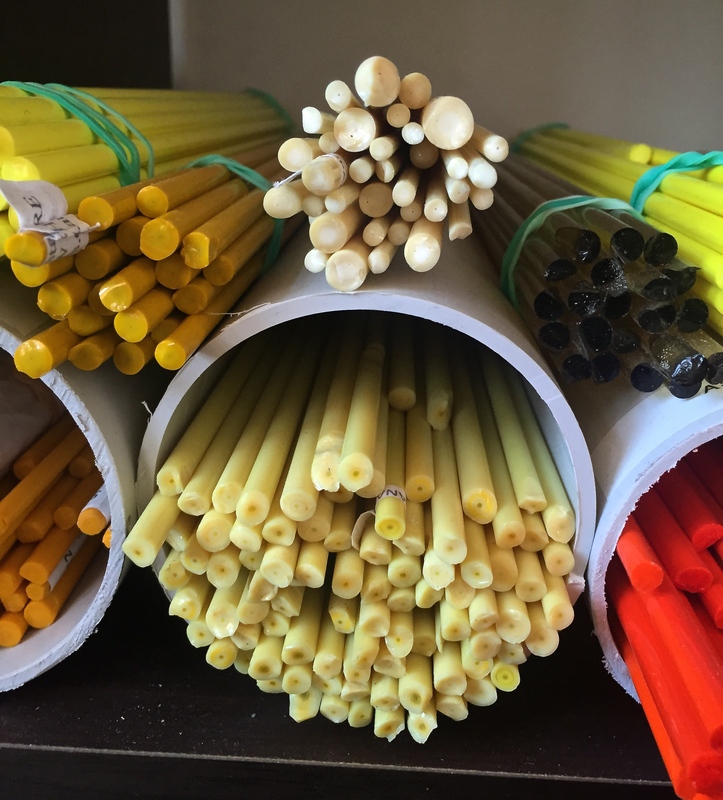 The flat one is a “ribbon” mandrel. It makes beads with a slot rather than a hole for threading onto flat ribbon or leather. Specialised mandrels are a relatively inexpensive tool, but they require a lot of practice to get looking right. I originally wasn’t going to talk about these types of tools, but they’re right up there for popularity. Big hole mandrels make big hole beads and rings. They come in a variety of shapes, sizes and styles. The Ring Topper Mandrel is a special tool that allows for a cabochon top with a threaded bottom for switching ring tops out on a ring base. 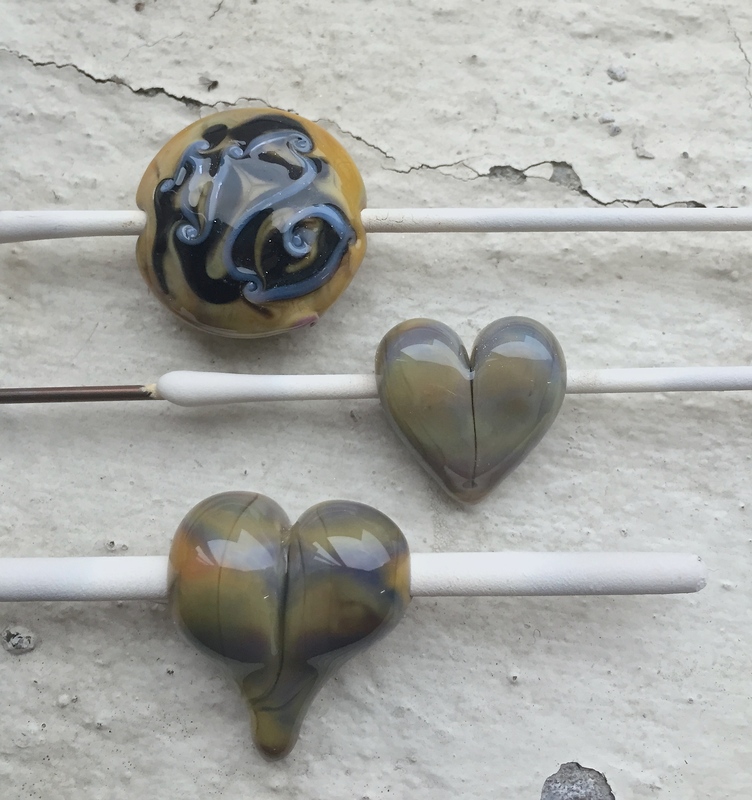 You can also buy Cabochon Mandrels to make cabochons in the flame rather than in a kiln. I’ve got the big hole mandrels and they’re never disappointing to use. They challenge you in a whole other way when it comes to heat control. I think they’re awesome to use after the 60 hour mark to really refine your “bead-under-the-flame-warming” habit. I don’t own any ring topper mandrels yet, I would need to dedicate some serious time to mastering how to make a cabochon in a flame. Then the cleaning of them would probably drive me loopy. You do need to get silicone carbide grit to clean the base of cabochons and ring toppers made in the flame. I hope this post has been interesting and gave you some insight and perspective that you might not have considered before buying a tool. If you are looking at becoming a registered business, all of your tools can be considered tax deductible. (they are in Australia). Now if that isn’t incentive to go out and buy tools, I don’t know what is!